One of the many benefits of a study season is the chance to follow new lines of research that we wouldn’t have time for during a normal field season. 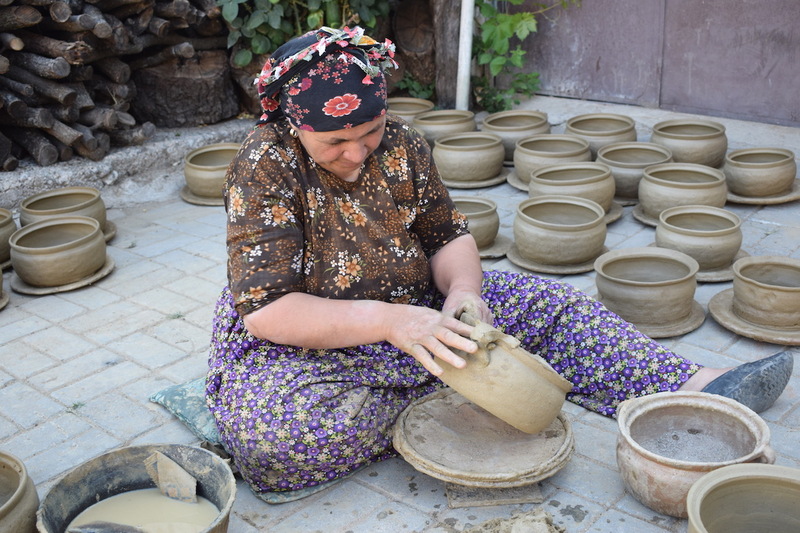 This year, a number of team members were lucky enough to visit Gökeyüp, a village on the outskirts of the Gediz Valley, and watch the traditional production of ceramics. 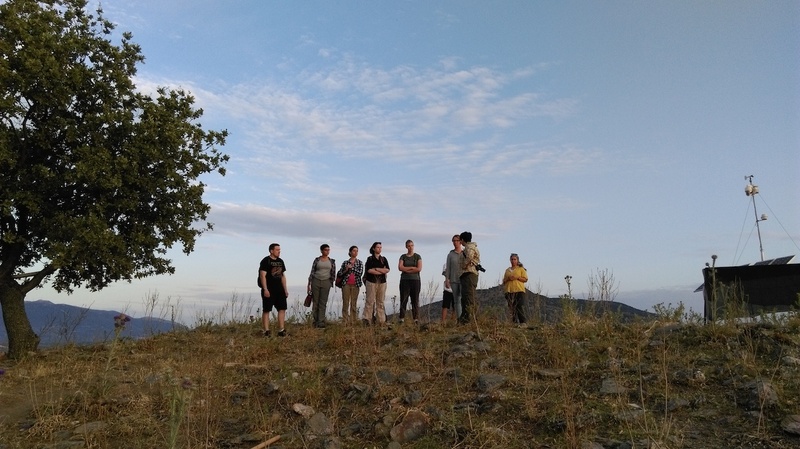 This is our first trip since excavation began at Kaymakçı, though we have visited the village multiple times over the past 15 years as part of the Central Lydia Archaeological Survey (CLAS). 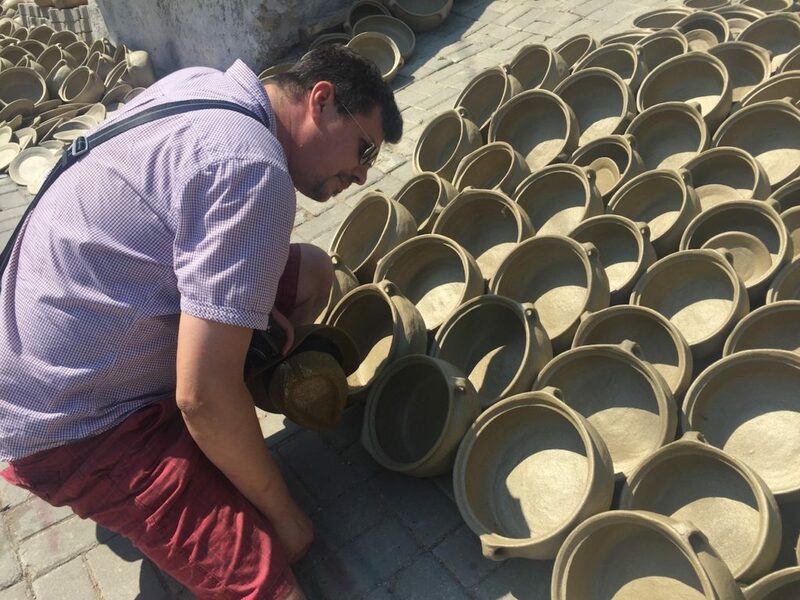 Ceramicist Peter Pavúk studies the unfired pots, which have been drying in the sun. Ceramics before firing (below) and after firing (above). 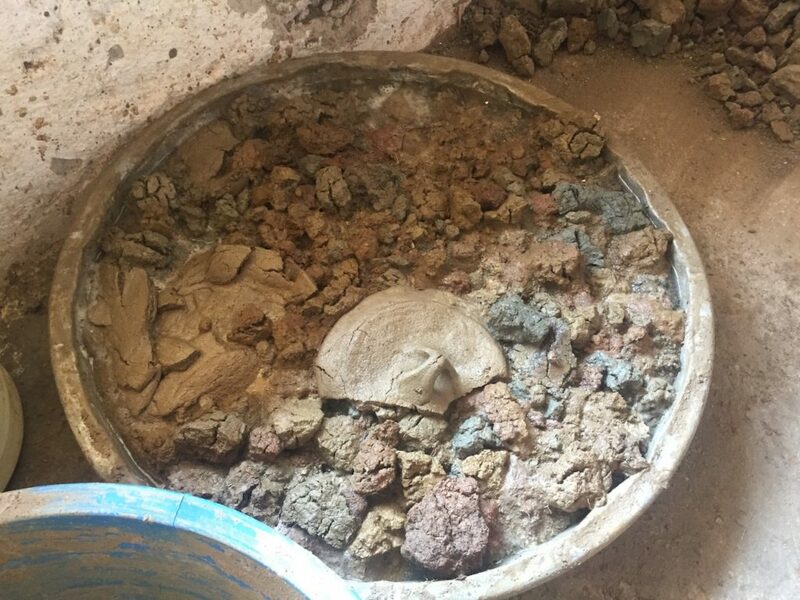 Wet clay ready to be mixed with mica. 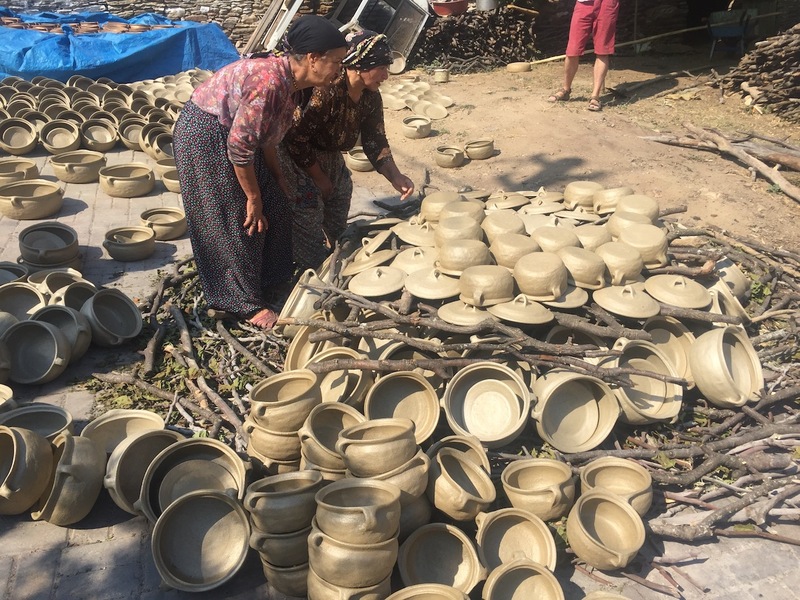 Our area has been known for producing “goldwash” pottery since the second millennium BCE. 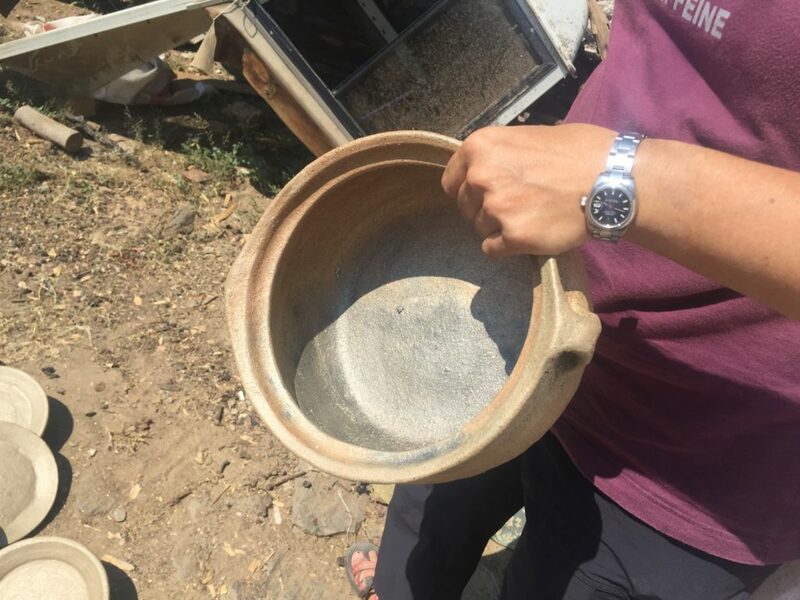 “Goldwash” generally refers to ceramics that have a deep gold or bronze color following firing, which is created using local mica. 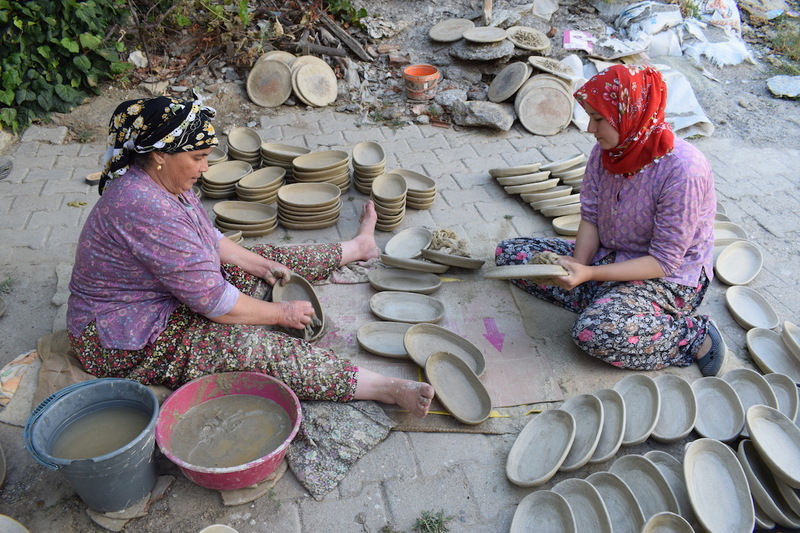 In Gökeyüp, mica is used as a temper to strengthen cooking pots, and as a wash or slip to make them shine. 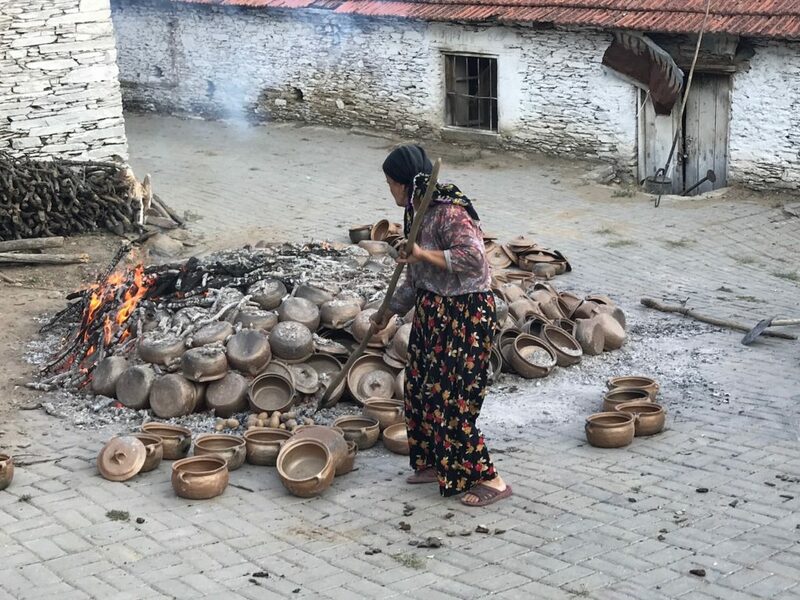 Goldwash ceramics are also found at Kaymakçı, though their method of production seems to be different. That said, observing modern production can still be informative. 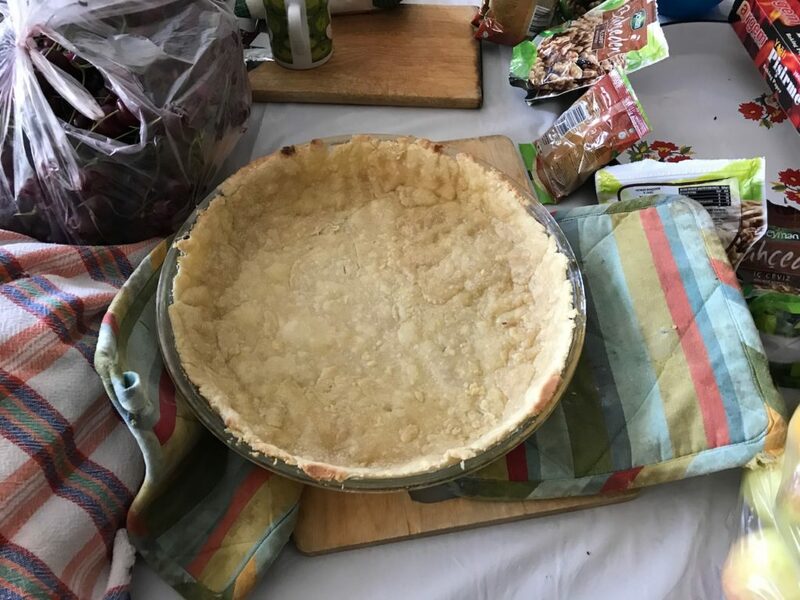 This pot has a silver spot where it wasn’t heated evenly. 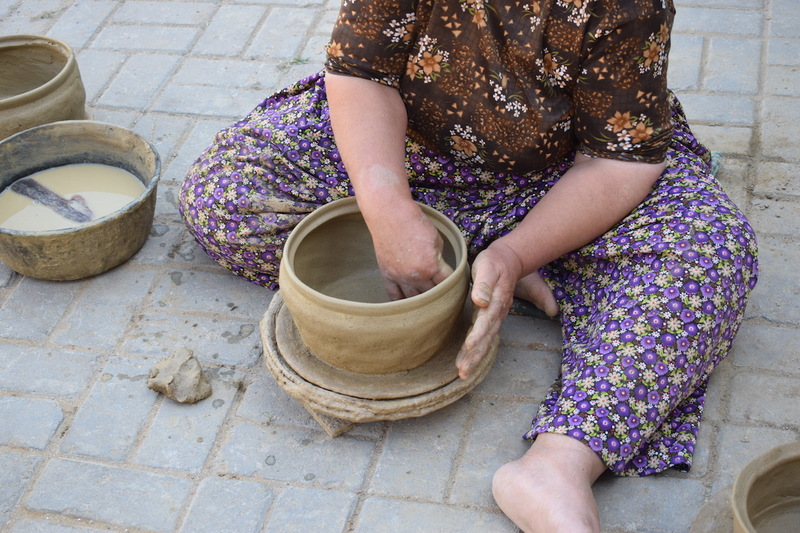 All the ceramics are made by hand by women who have passed down the skill over time. 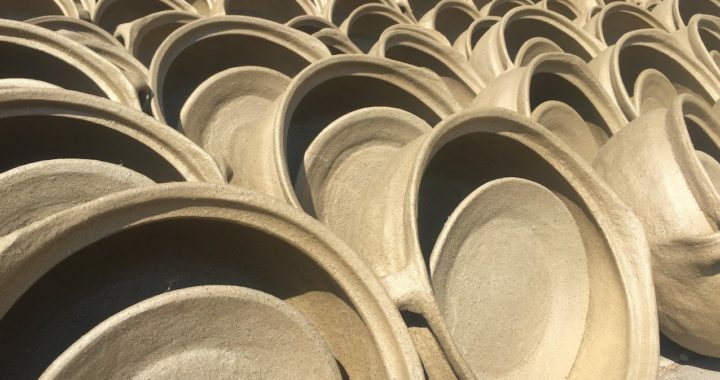 For this firing, they made 800 objects in two weeks! 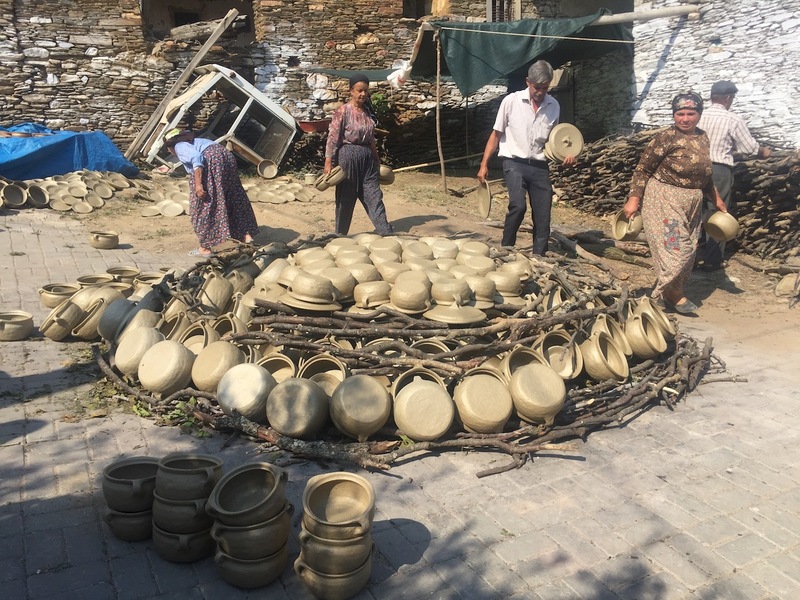 When pots are ready to be fired, the potters build a circular pyre and stack the ceramics on top, covering them with wood. 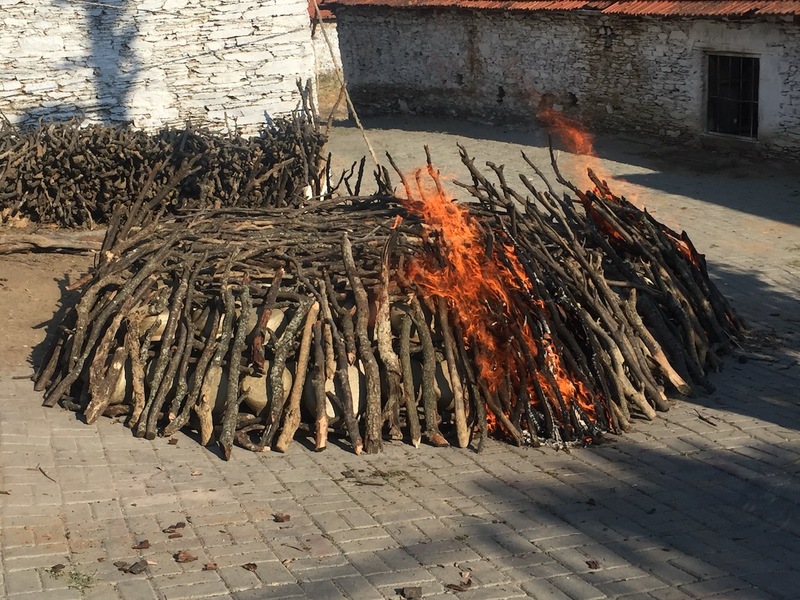 The location of the pyre here is in the street, at an intersection that gets a lot of wind to stoke the flames. 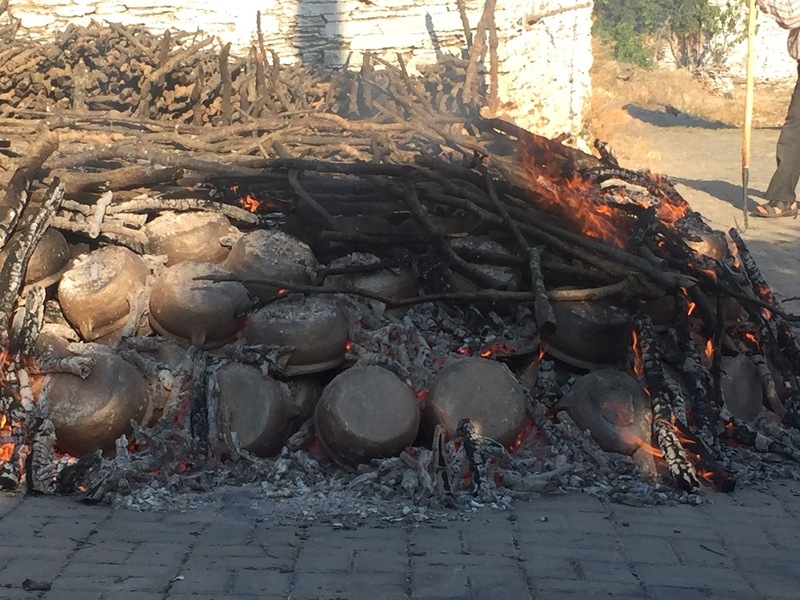 The firing takes anywhere from about 30 minutes to two hours, and is carefully controlled. 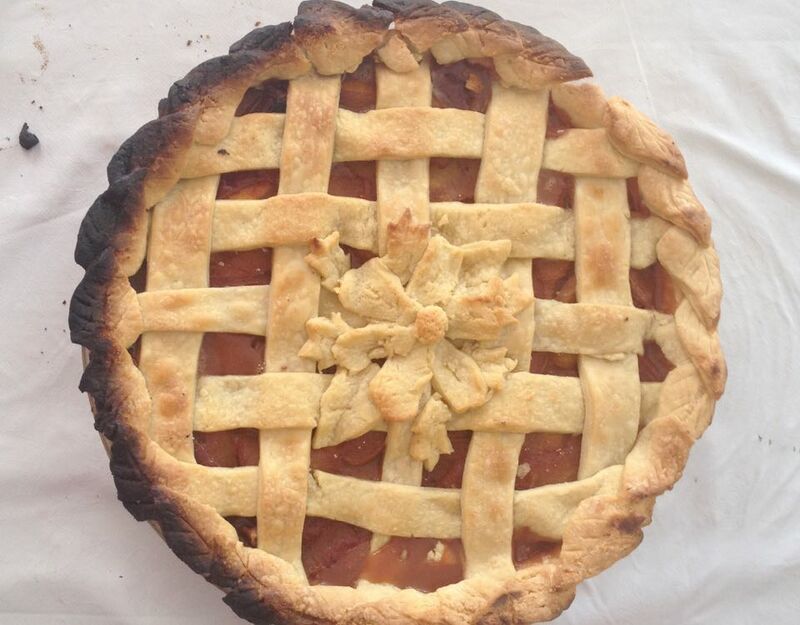 The firing is a social event. 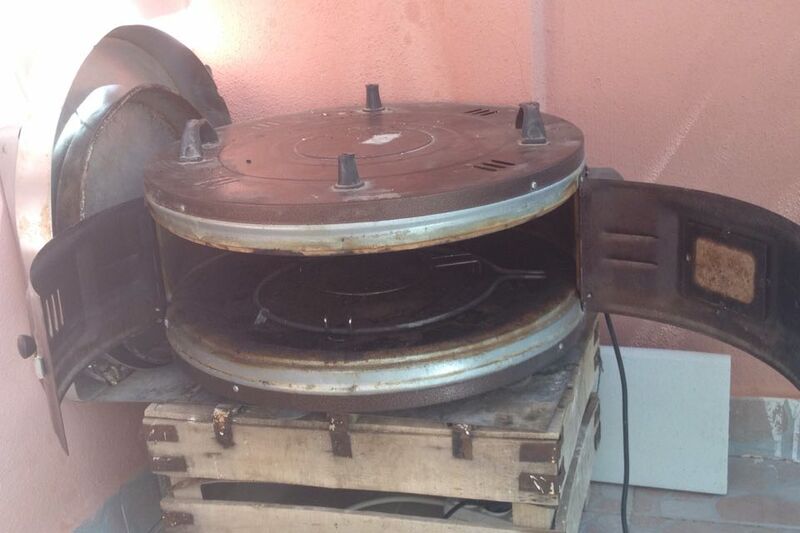 Neighbors came to help and to watch, and even cooked potatoes on the embers for a snack! 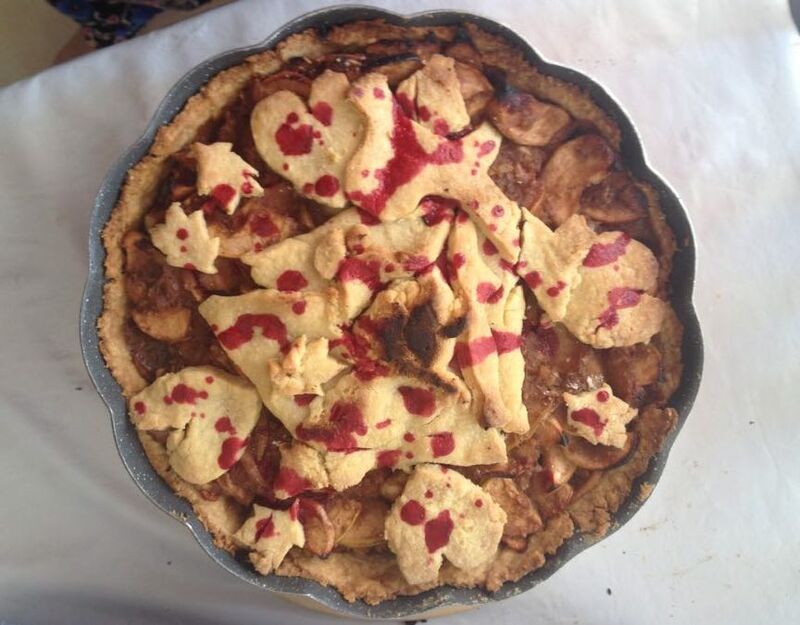 We are very thankful for the opportunity to have observed and participated in this local tradition. 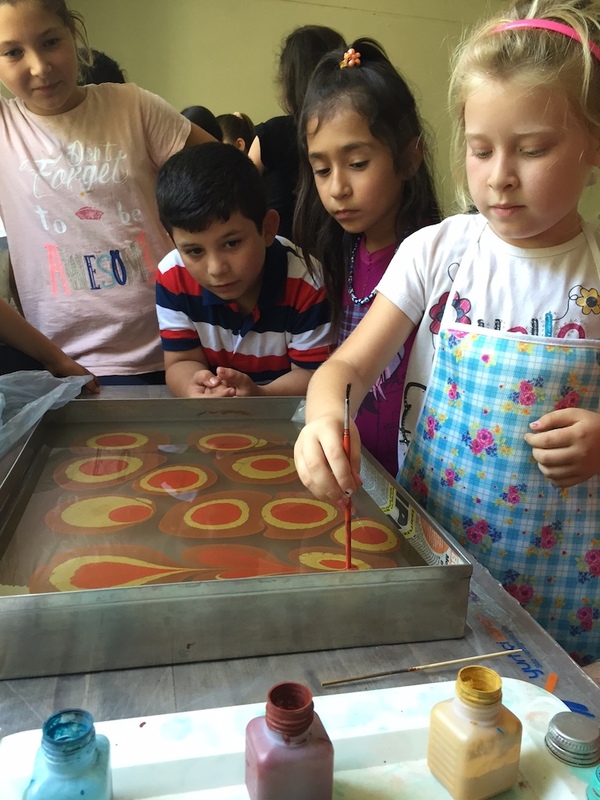 The first weekend in July brought ebru (marbling) artist Nedim Sönmez to Tekelioğlu. 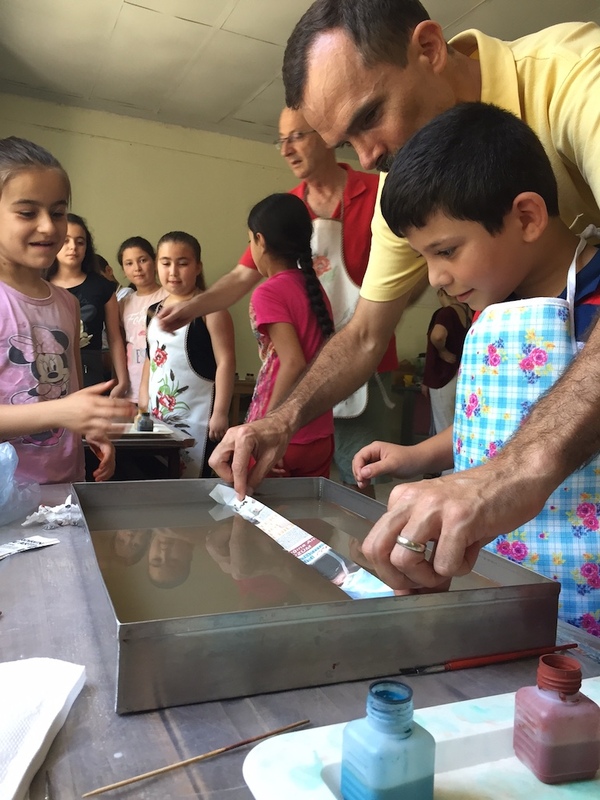 He offered ebru and papermaking workshops for the children of the village. 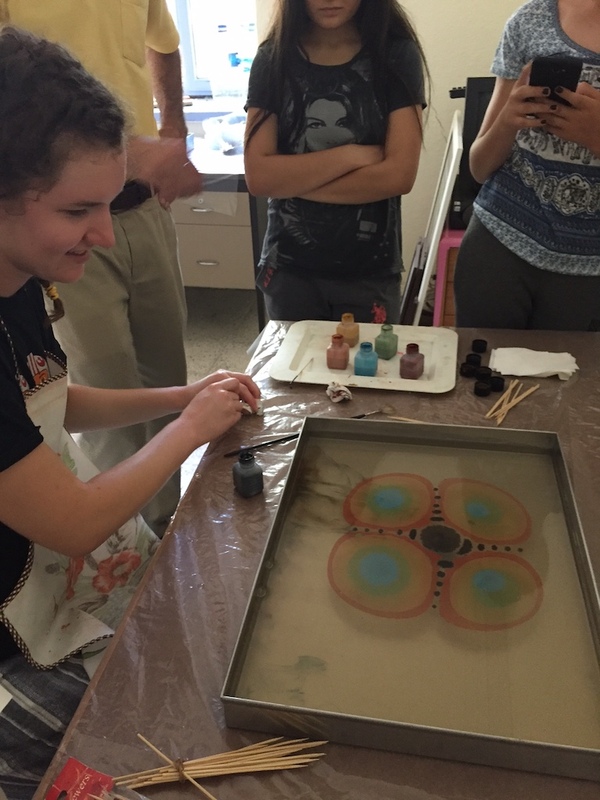 Short lectures and videos covered the history of these crafts in Turkey, and then the students had many opportunities to try the crafts themselves. 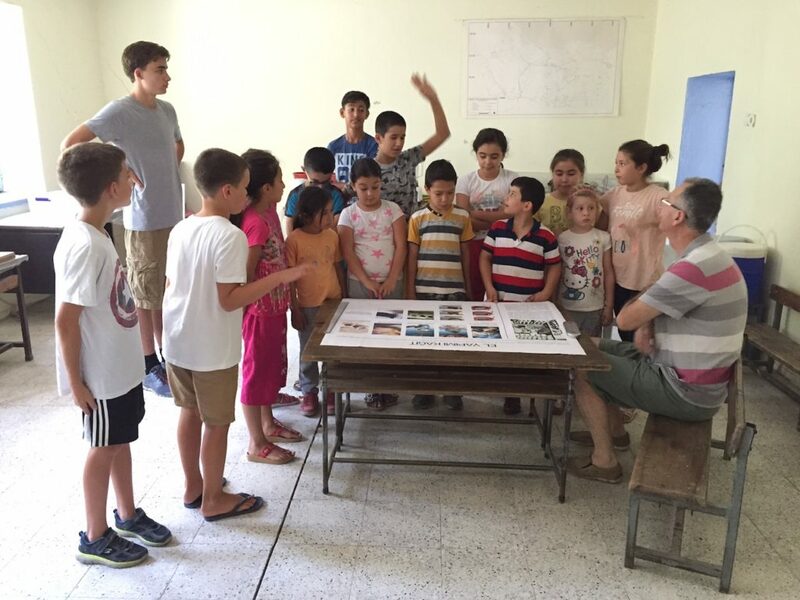 Children were able to share ideas and approaches for two days. 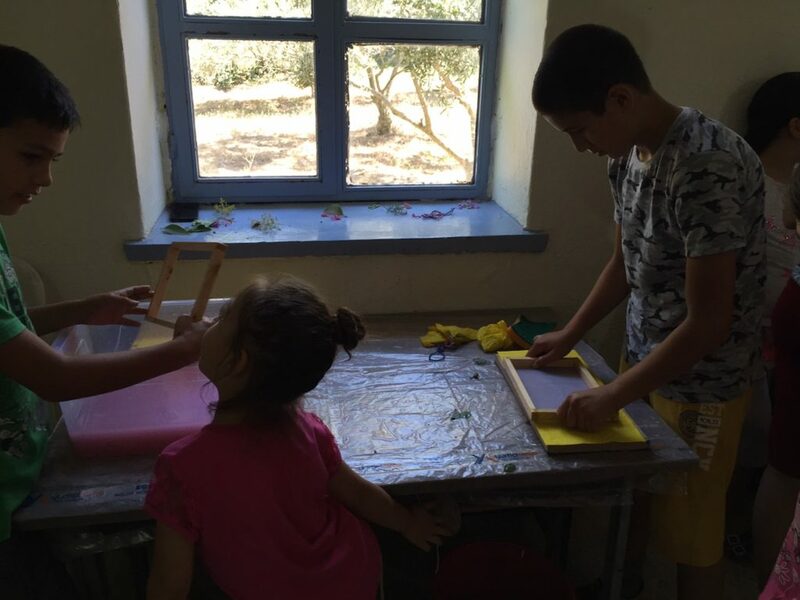 At the end of the workshops, they brought their art back to their families. 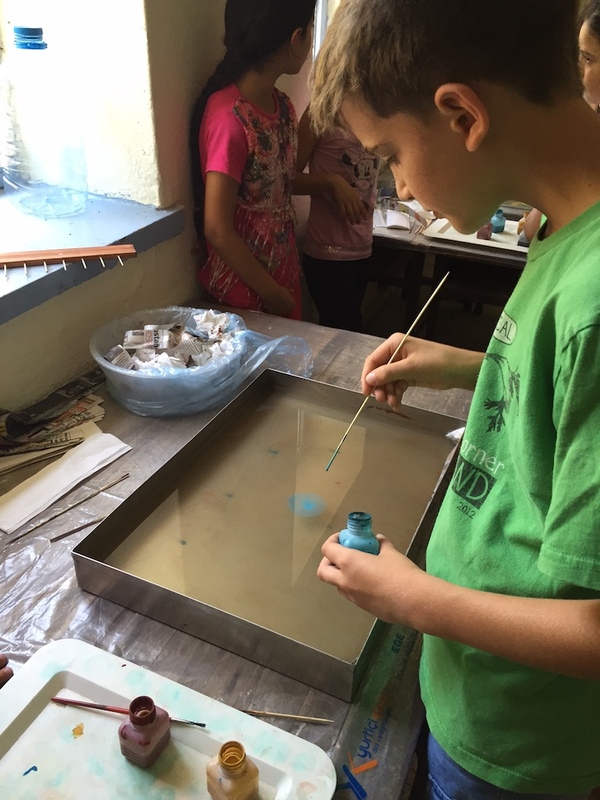 Nedim is the director of Ege University’s Paper and Book Arts Museum in Bornova, Izmir, as well as an established and well-known artist. This is his second workshop with our project. 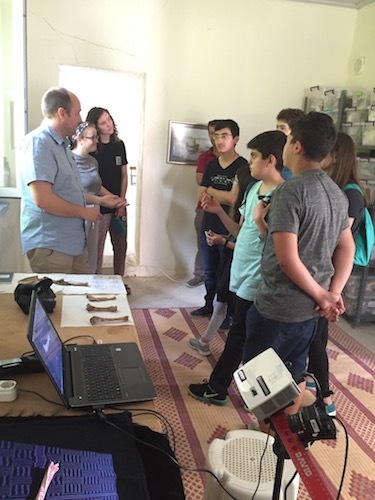 Last week, the Kaymakçı Archaeological Project (KAP) and the Fen Bilimleri School in Salihli had the opportunity to spend the day together. 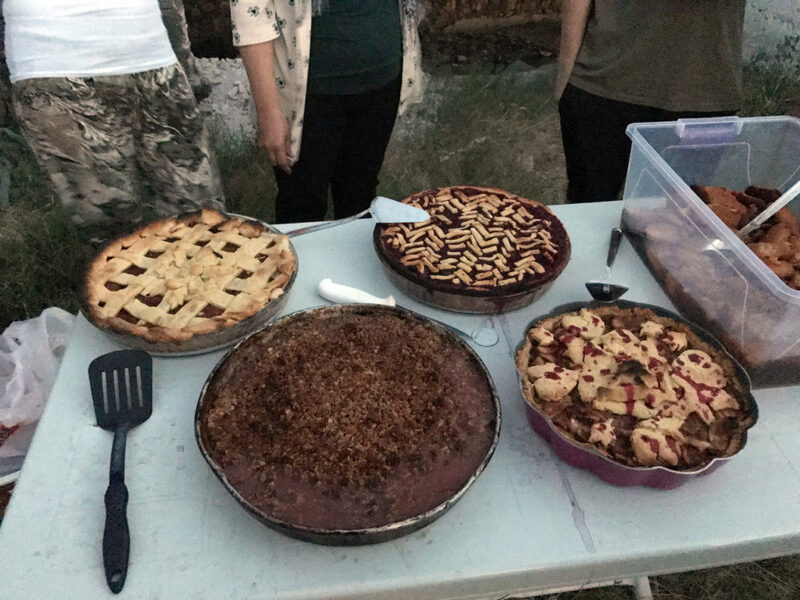 After tea, fresh apricots and homemade pastries, the students were split into three groups. 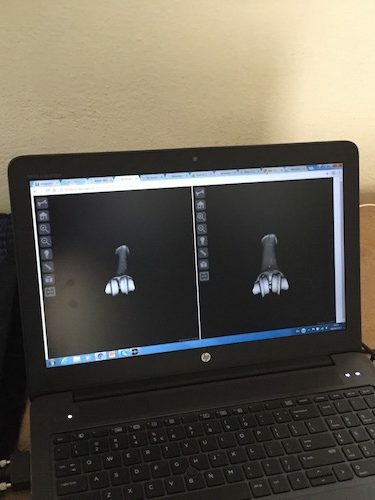 In the ceramic lab, they were shown recording methods and 3D scanning. 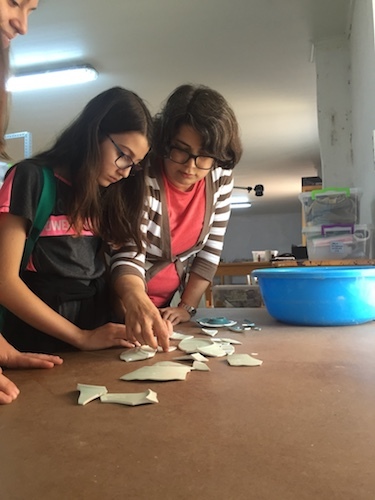 In the conservation lab, students learned about objects and science, and they tried to mend broken plates (from the local department store Kipa). 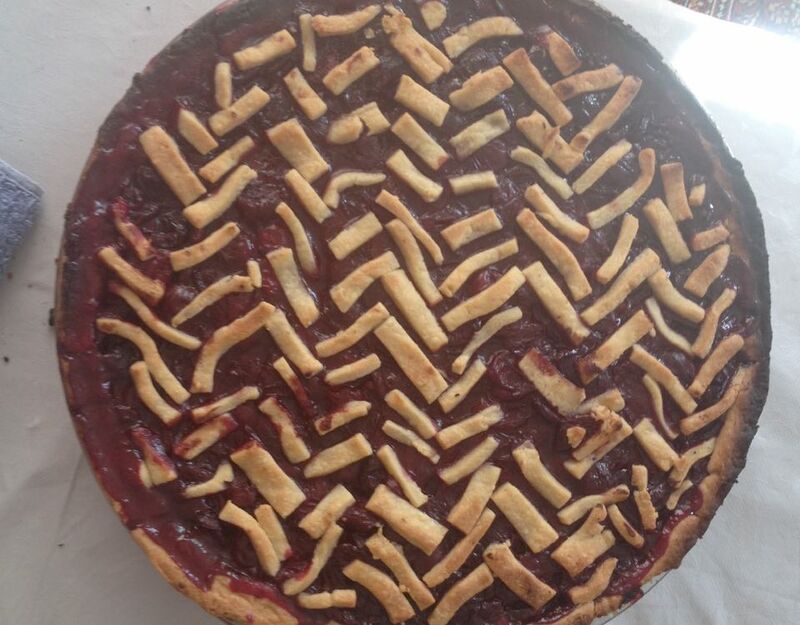 It was hard! 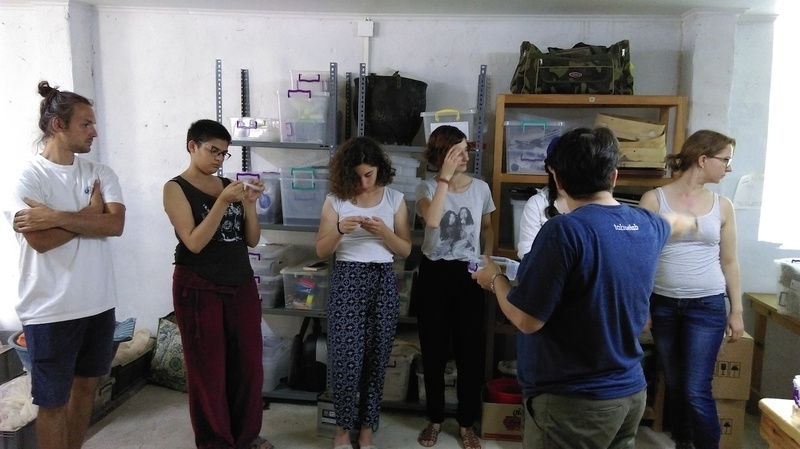 In the zooarchaeology lab, they discussed the details of studying bones from the archaeological record to understand food patterns but also arts – wool and leather especially. 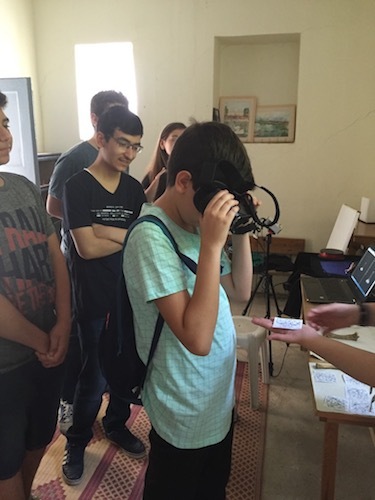 KAP team members introduced students to using 3D images and virtual reality to determine the difference between sheep and goat bones. 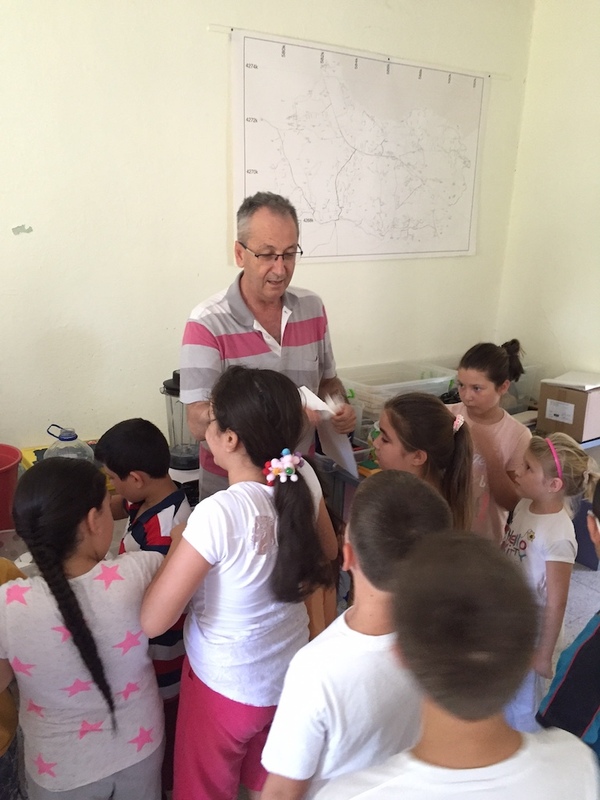 In the afternoon, KAP members visited the school in Salihli. 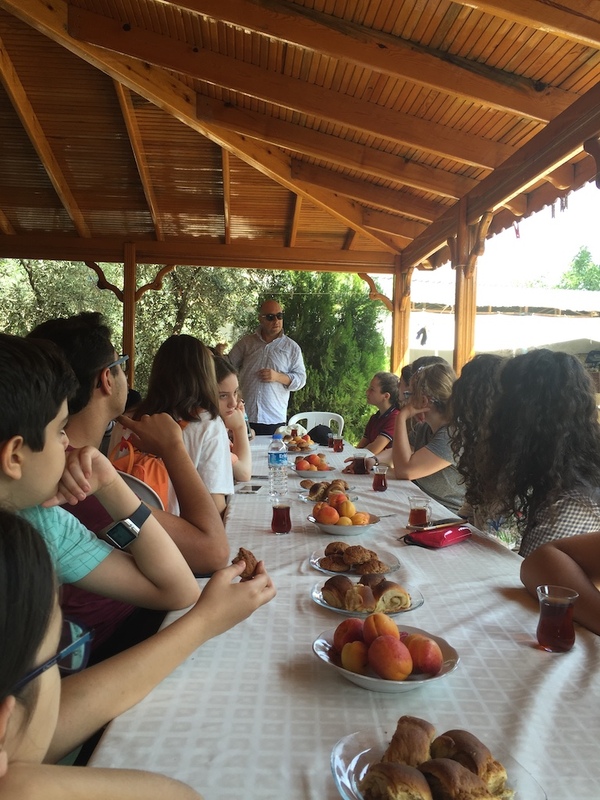 During a lovely poolside lunch, we met the director and talked with teachers and students about their school and future collaborations with KAP. 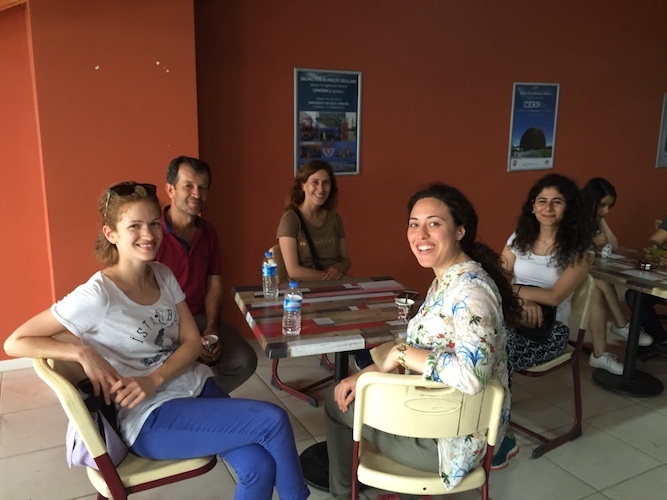 We were impressed by their English and felt ashamed that we didn’t speak more Turkish! 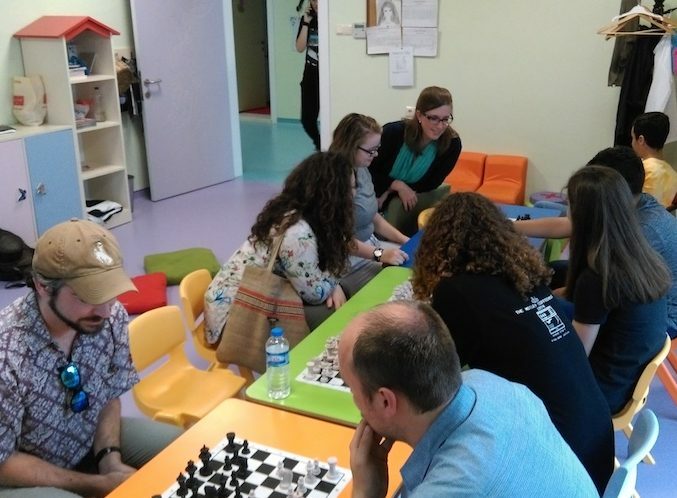 We were then shown the lower school, including the terrific chess room. 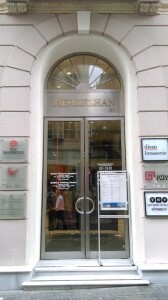 We toured the main building to see classrooms as well as the wonderful café on the upper floor. 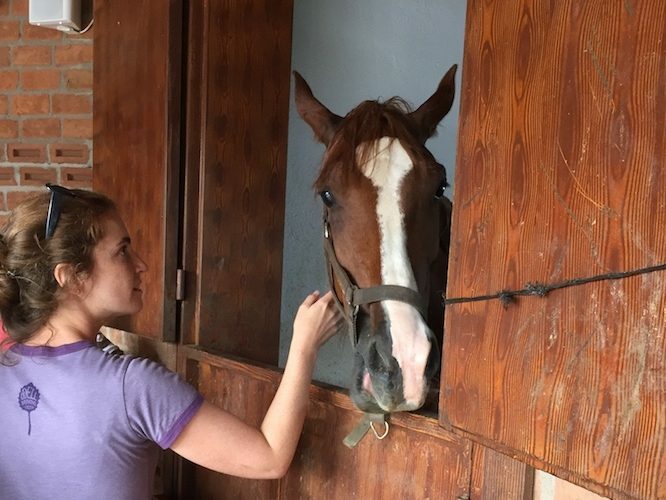 Our time ended with a visit to the horses. We learned that this part of the curriculum promotes civil engagement and appreciation of animals. 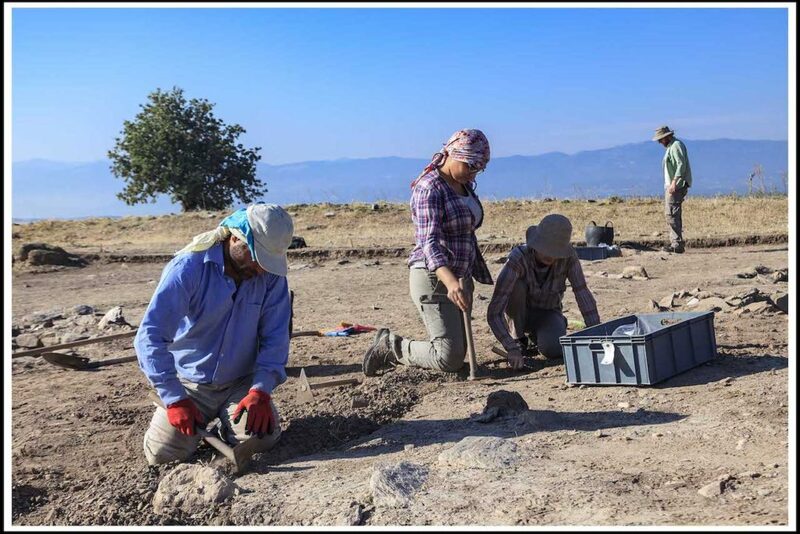 Newcomers to an archaeological project usually have a period of adjustment. Luckily, here at Kaymakçı, a fast-paced learning environment and very friendly team and staff can help alleviate newbie stress. 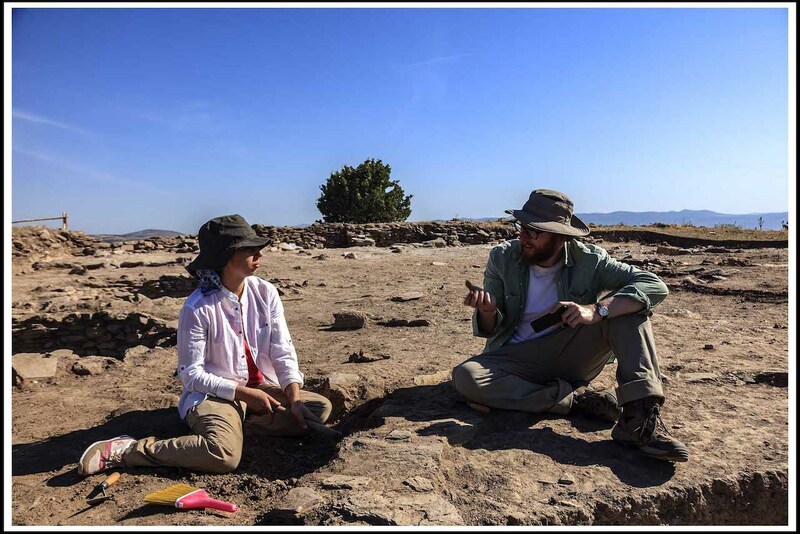 Haley is a recent graduate from San Diego State University and has a background in the archaeology of California. 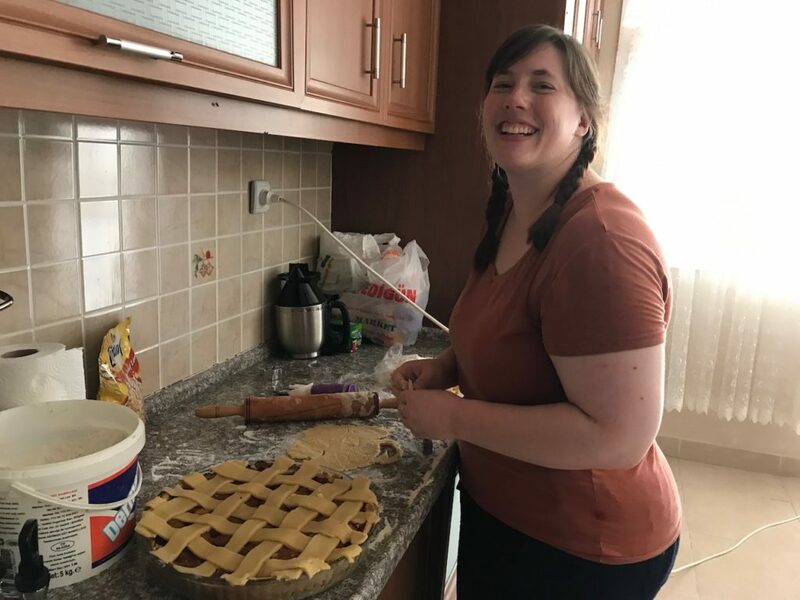 Joska received a MA degree from BBU from Cluj-Napoca, Romania, and has experience in excavating Bronze Age sites in Transylvania. 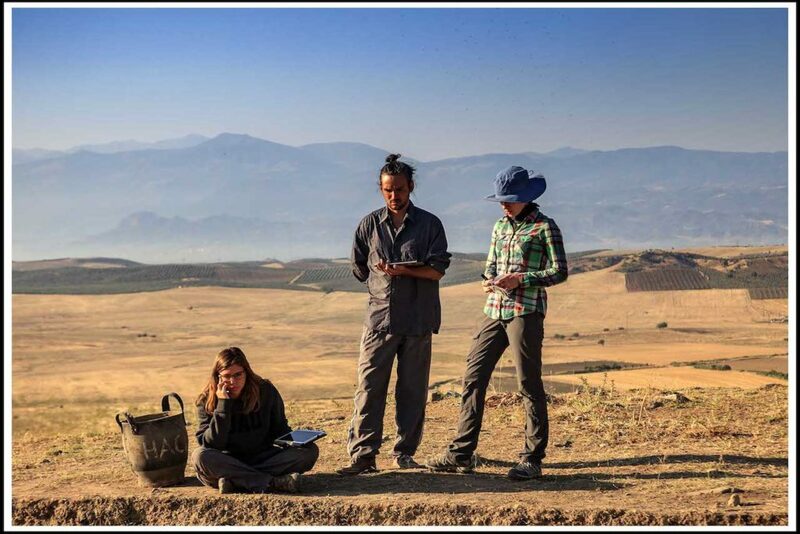 We both decided to join this project to widen our knowledge of digital archaeological technologies and to experience a new environment. Teamwork: Haley Chasteene recording coordinates with the RTK GPS, while Joska Puskas holds a digital photogrammetry target in place. We enjoy the opportunity to learn and use a more digitally based recording system. 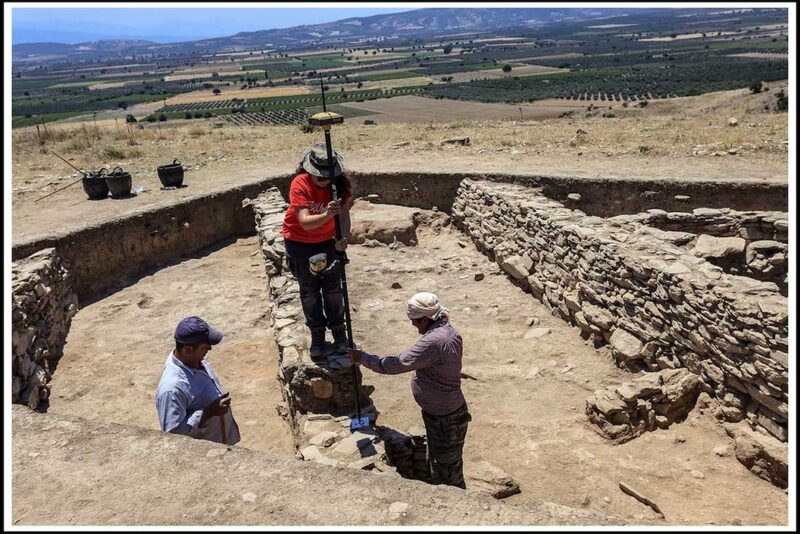 Recording new features in our excavation area. 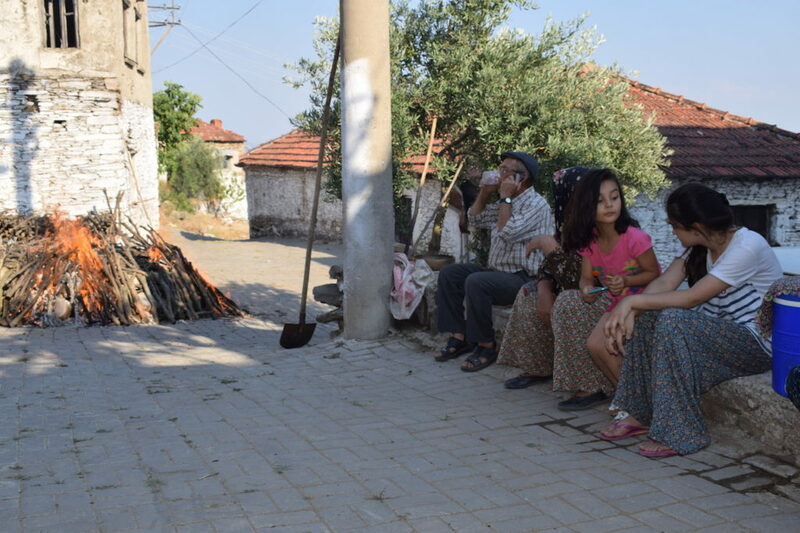 Our staff lives in villages surrounding Kaymakçı. 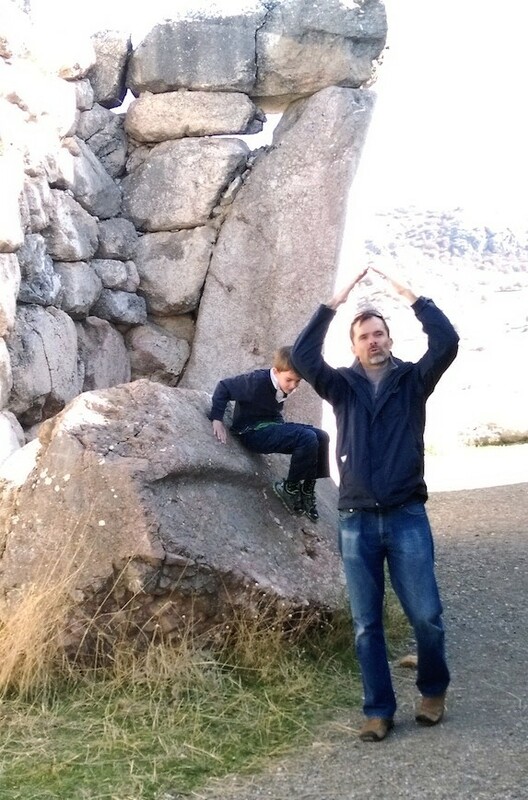 Having daily exposures to local culture and language is just another perk of this already rewarding archaeological experience. 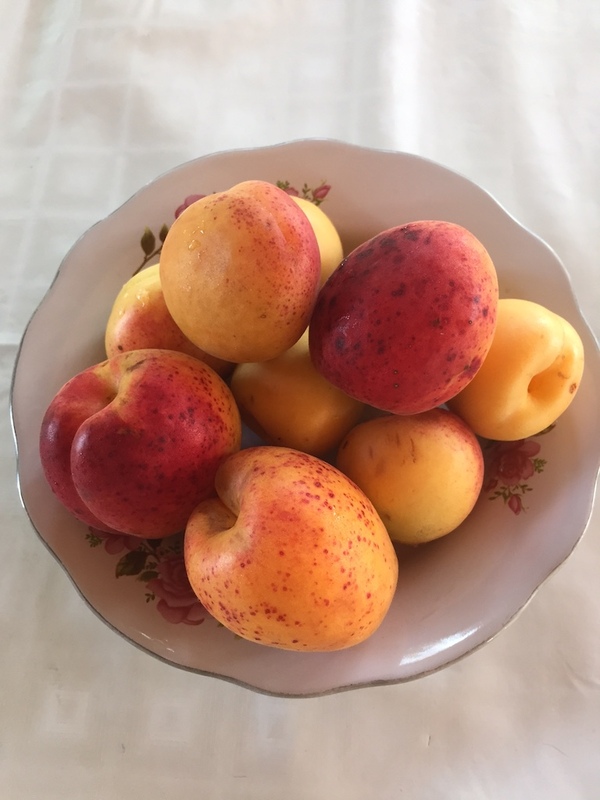 Çay mola. One of our favorite times of the day. 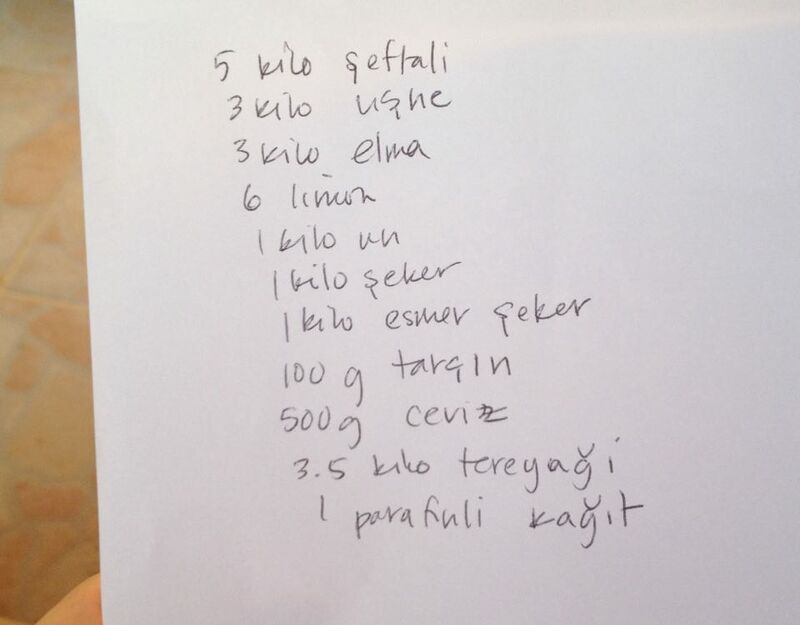 Every day we continue to widen our knowledge of a paperless digital recording system, while also spanning our view of Turkish culture and language. We are very thankful to be a part of the team. 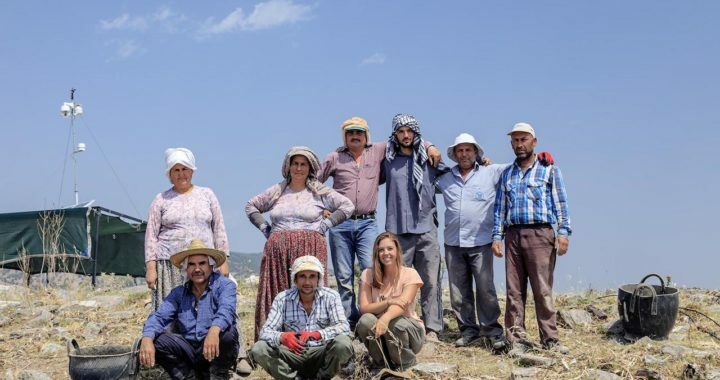 It was with great pleasure that I joined, even if only for 10 days, the resident Gygaia team in Istanbul, more specifically my colleagues working at the Research Center for Anatolian Civilizations (ANAMED). 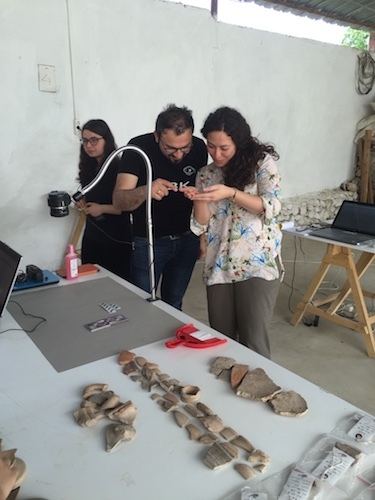 My experience working extensively at excavations and in museum collections in Western Anatolia, the Aegean, and Europe (most notably my 15 years at the site of ancient Troy) has helped me a lot to frame the new finds from Kaymakçı, where I serve as one of the senior ceramic analysts. 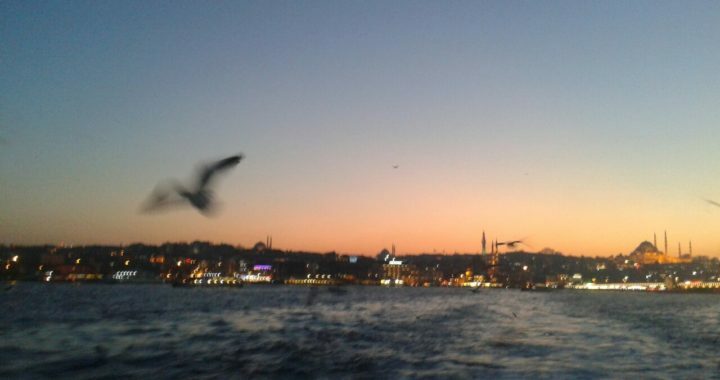 Unsurprisingly, the main aim of my visit to Istanbul centered around planning the upcoming 2016 field season, discussing with Christina Luke and Chris Roosevelt various prospects, but also publication strategies. 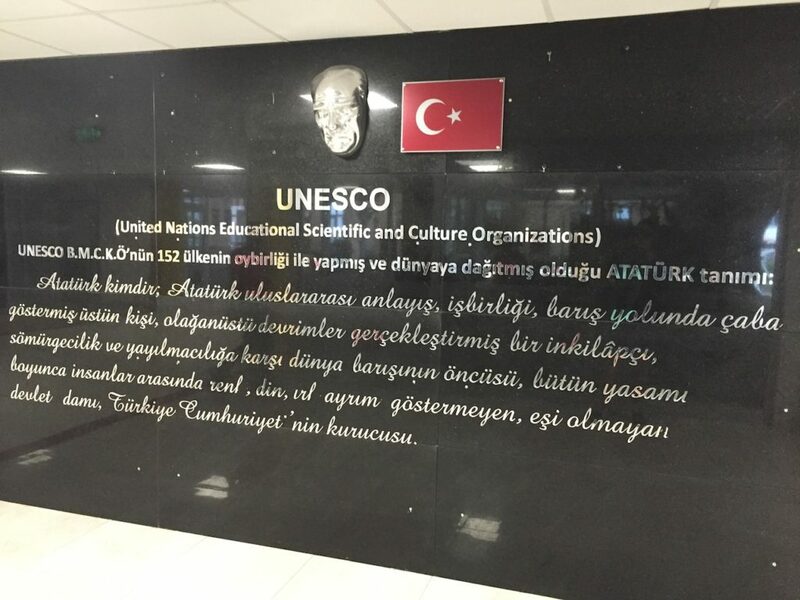 I was given also a tour of the impressive Koç University campus in Sarıyer, including the Koç University Surface Science and Technology Center (KÜYTAM ), for archaeological and other scientific analyses. 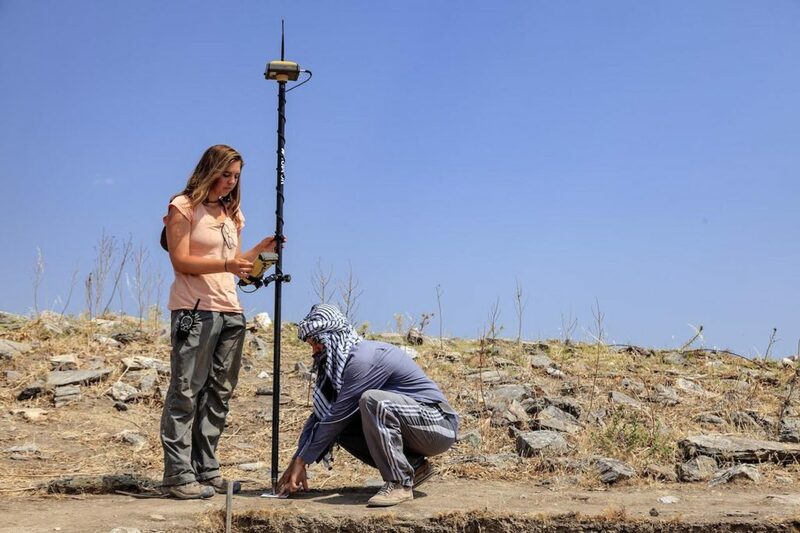 In addition to my work at Kaymakçı, I am also involved in collaboration with the German team at Pergamon, where I previously participated in evaluation of the data from the prehistoric survey in the central and lower Kaikos Valley. 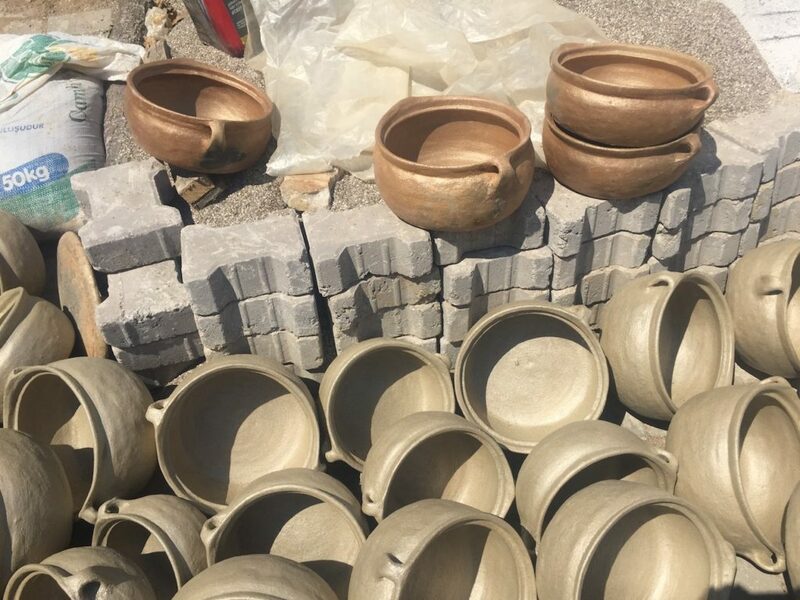 I am currently also involved in a re-study of the pottery and stratigraphy of the so called early fortification, published originally as Archaic (6th century BCE) by W. Radt, but later re-dated to Middle/Late Bronze Age (mid 2nd millennium BCE) by D. Hertel. 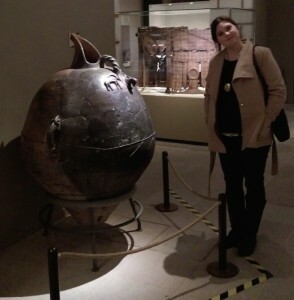 Therefore, I also managed to do some work in the Pergamon Archive. 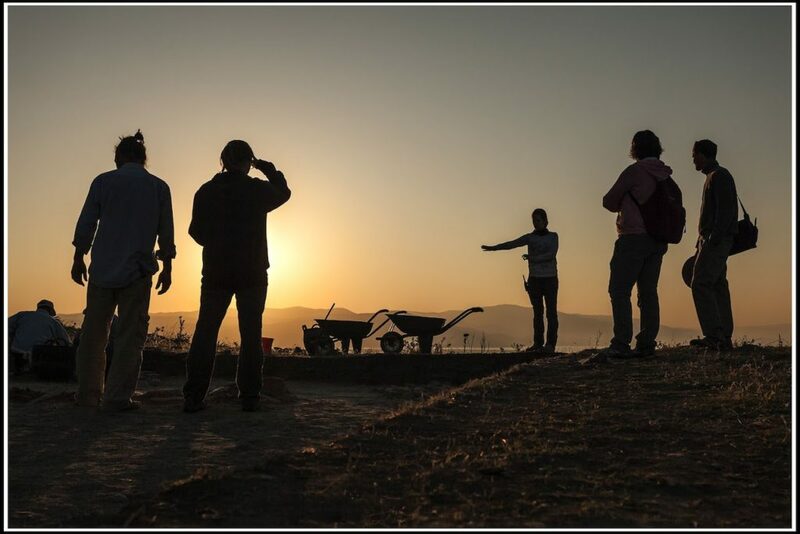 While the processing and analysis of objects is certainly the focus of my work, the opportunity to travel during the year and meet with fellow researchers in collaborative environments is extraordinarily valuable. 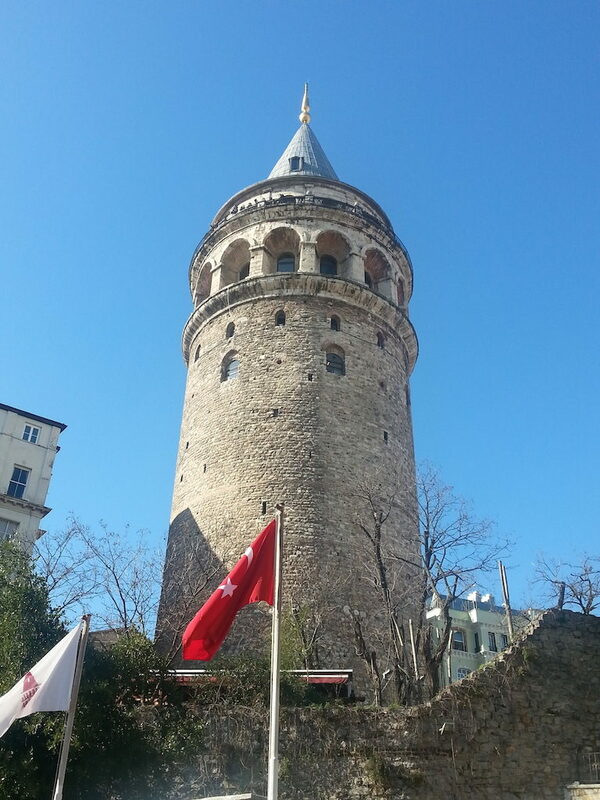 Not only was I able to meet with colleagues from Gygaia Projects and Pergamon, but I also had the opportunity to listen to lectures and sit and talk with friends based at various archaeological institutes in Istanbul. 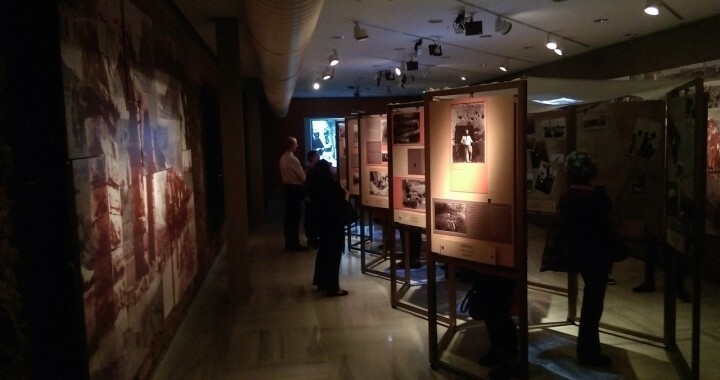 Scholarly conversation takes place in many venues, one of which is through the presentation of new data and ideas at conferences and as part of lecture series. Such presentations offer an exciting opportunity to collaborate with and get feedback from colleagues around the world. 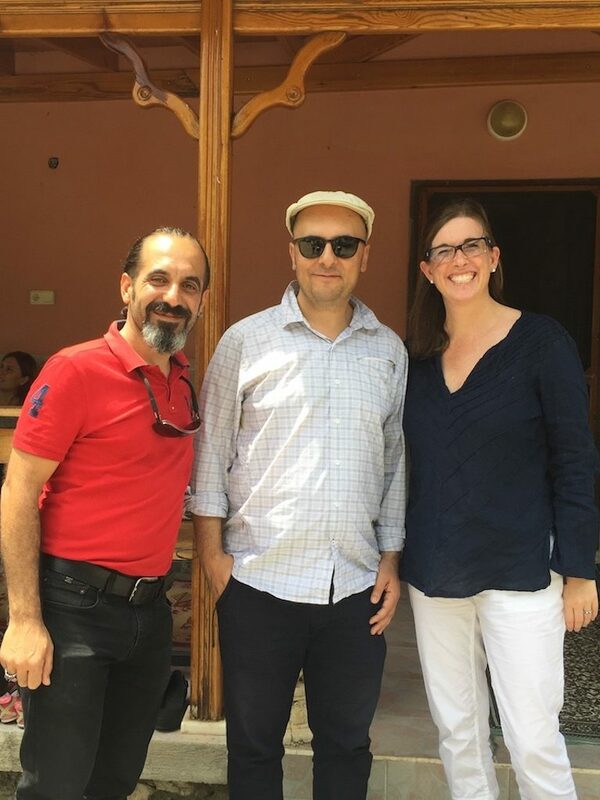 In mid-February, Christina Luke attended a terrific conference and workshop entitled: “New Approaches to Historic Landscapes.” Her presentation focused on the construction of "heritage and history" through the lens of sovereignty in the Gediz Valley. 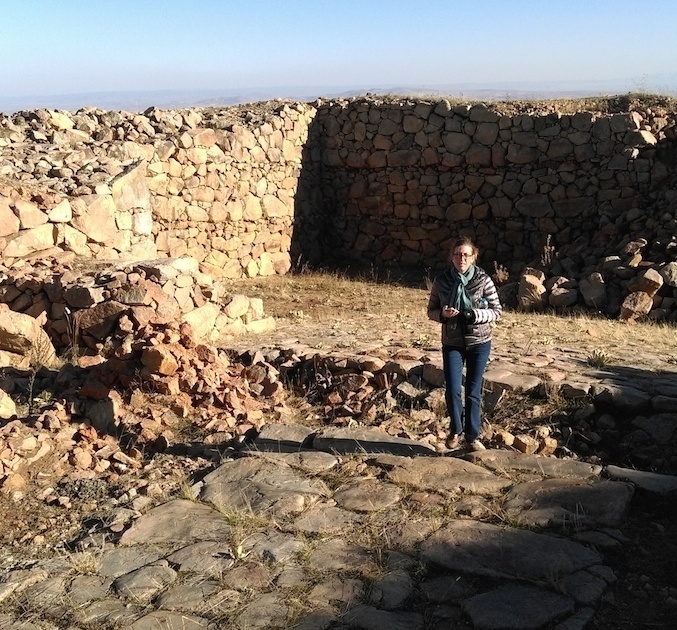 The title of her paper was "Deep Time: Cultural Landscapes from Antiquity to Modernism in the Gediz Valley, western Turkey”. 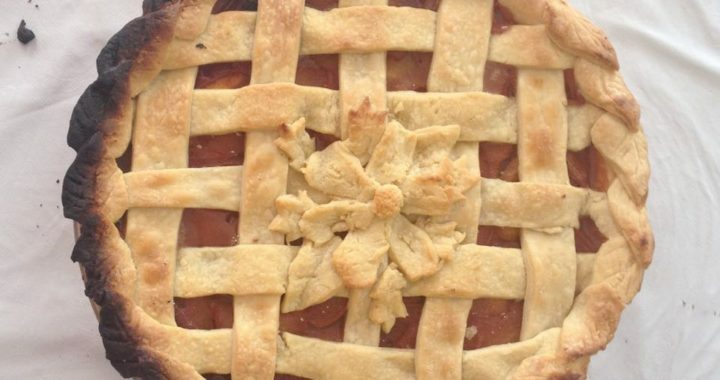 Christina asked how "the right heritage" is often celebrated at the expense of other historical narratives. She argued that historical landscape analysis offers one way forward in understanding change over time. 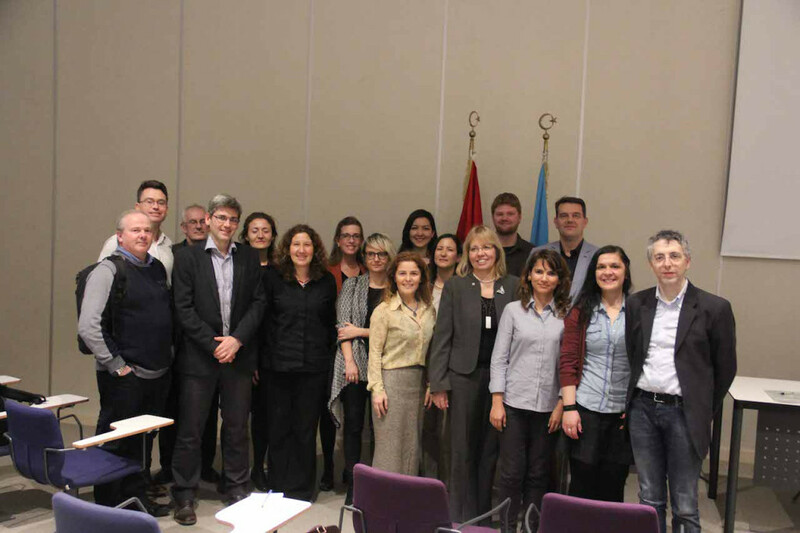 The sessions were supported by a British Academy Newton Fund Advanced Fellowship, and led by Mimar Sinan Fine Arts University (Turkey) and Newcastle University (UK). 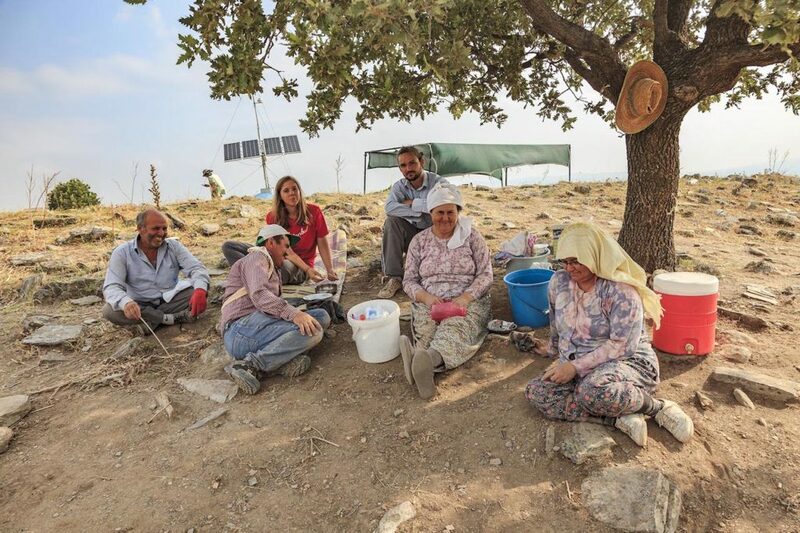 It is our hope to collaborate with various new colleagues to begin a historic landscape analysis of the Gediz Valley. 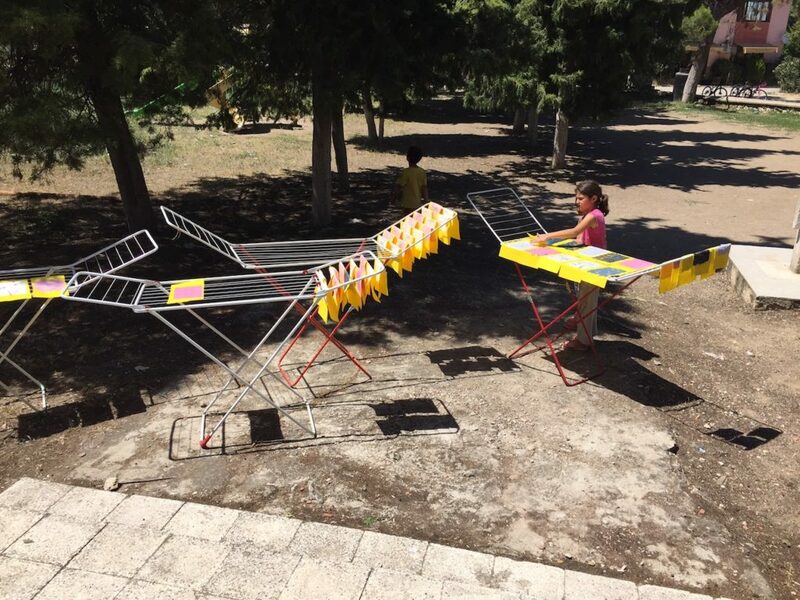 Chris Roosevelt recently spoke on two occasions about the ongoing work of Gygaia Projects. 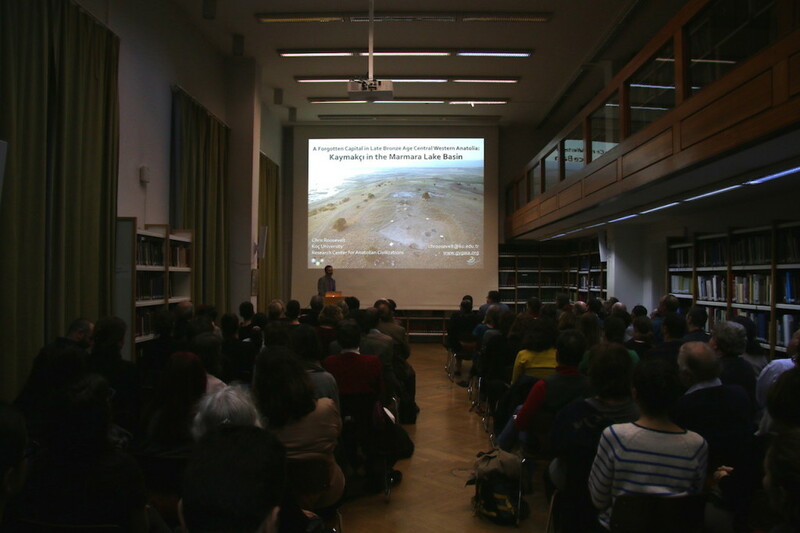 His first talk took place at the German Archaeological Institute as part of their ongoing lecture series. 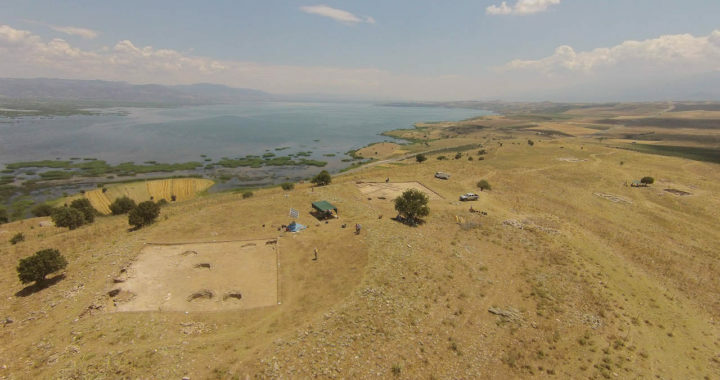 The title of his paper was “A Forgotten Capital in Late Bronze Age Central Western Anatolia: Kaymakçı in the Marmara Lake Basin.” Chris talked briefly about the results of the Central Lydia Archaeological Survey, which found a network of second-millennium BCE citadels around Lake Marmara, and presented some initial results of the ongoing excavations at Kaymakçı under the Kaymakçı Archaeological Project. 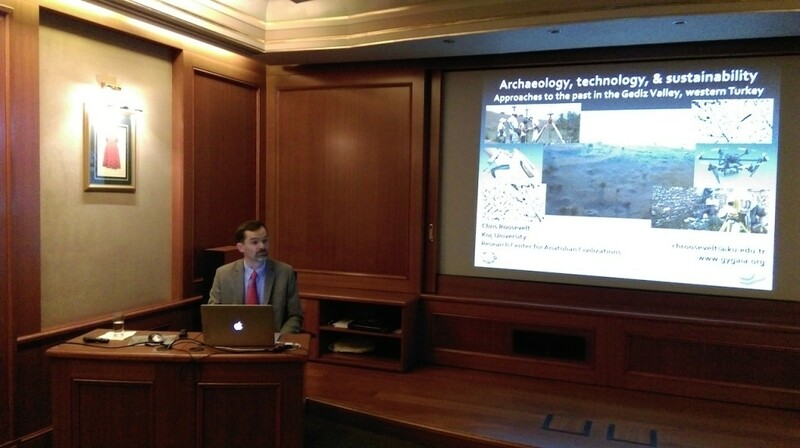 His talk was well attended by members of the archaeological community in Istanbul. 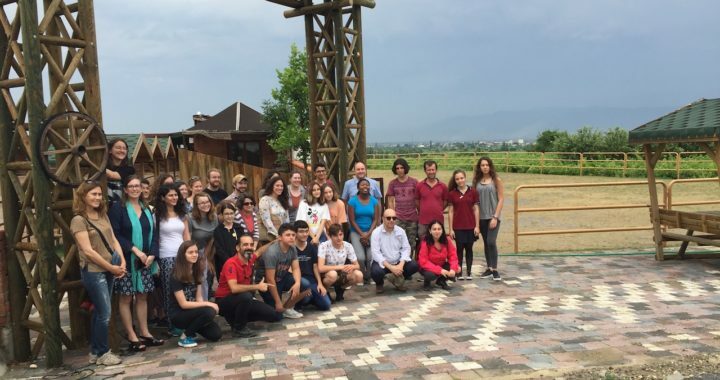 Recently, project members ventured to Central Anatolia as part of a trip organized by Koç University’s Research Center for Anatolian Civilizations. 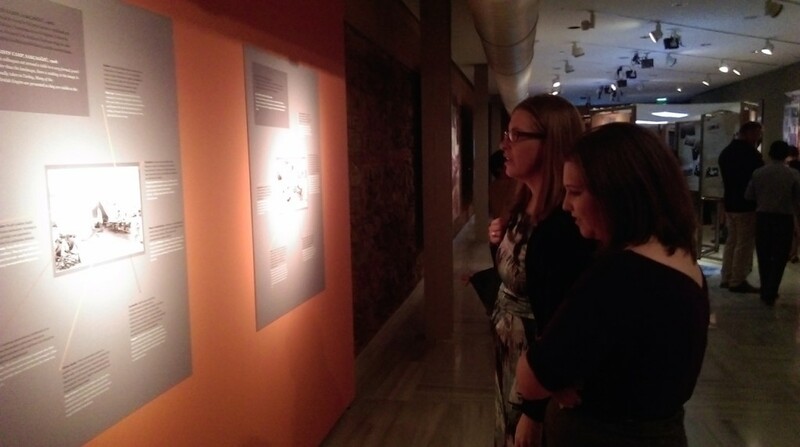 The first destination was Ankara, where we visited the Museum of Anatolian Civilizations and participated in a joint symposium with VEKAM (Vehbi Koç ve Ankara Araştırmaları Merkezi), the RCAC’s sister institution. 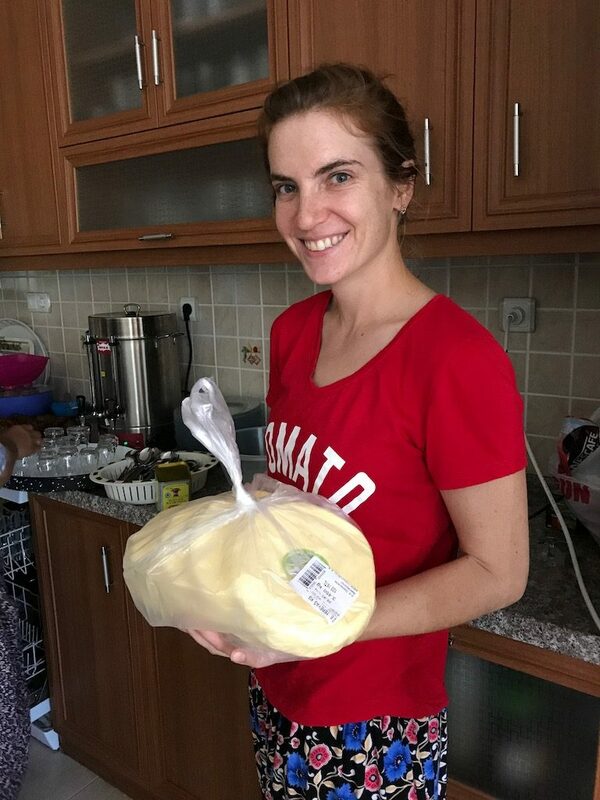 Jana Mokrisova gave a talk at the symposium that examined the appropriateness of some popular models that emphasize the presence of imports from Crete and Greece and locally produced imitations of them in western Anatolia during the Late Bronze Age as part of a conference organized by VEKAM. 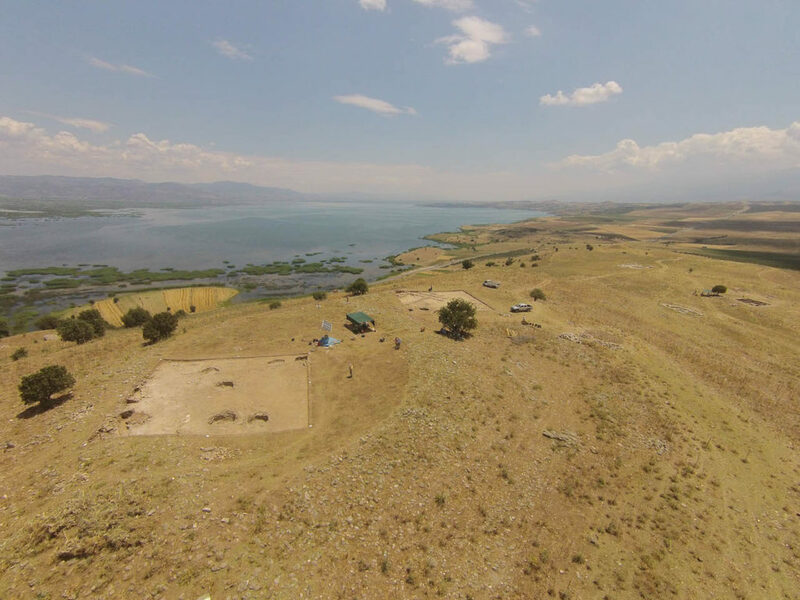 Next, we traveled to Kerkenes Dağ, a large Iron Age (seventh century BCE) city constructed by the Phrygians. 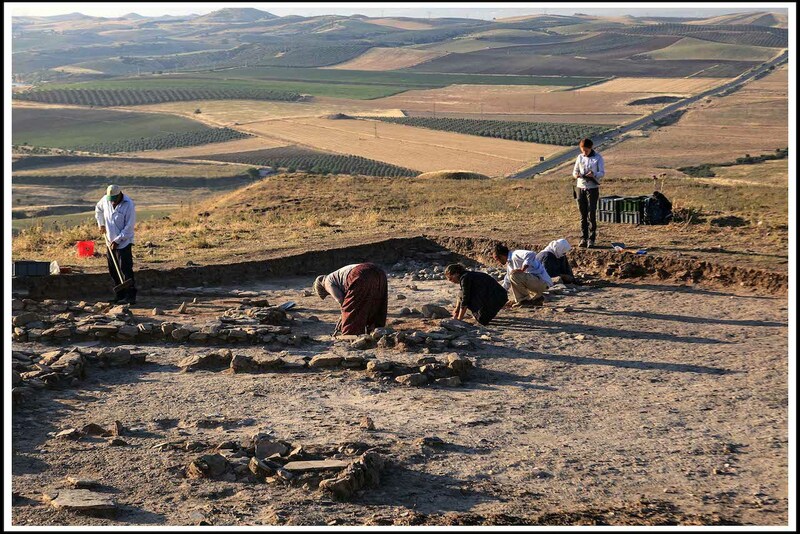 The history of this site is of particular interest to us working in Lydia, as Kerkenes was a multicultural city and its archaeology shows links with the Lydian kingdom. 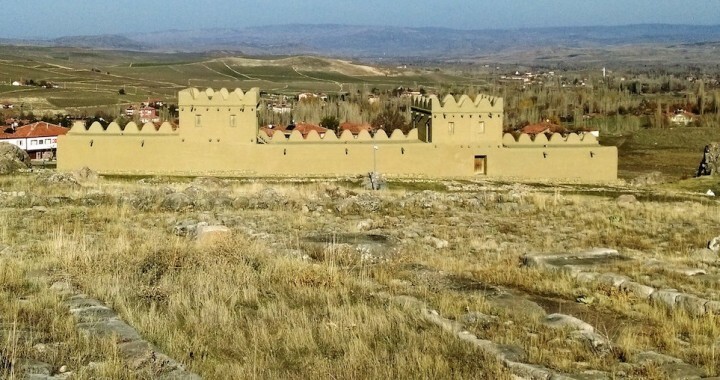 The city was inhabited for only about three generations, and it is thought by some to have been destroyed by the Lydian army; fortunately, this Lydian invasion was less damaging than the last! 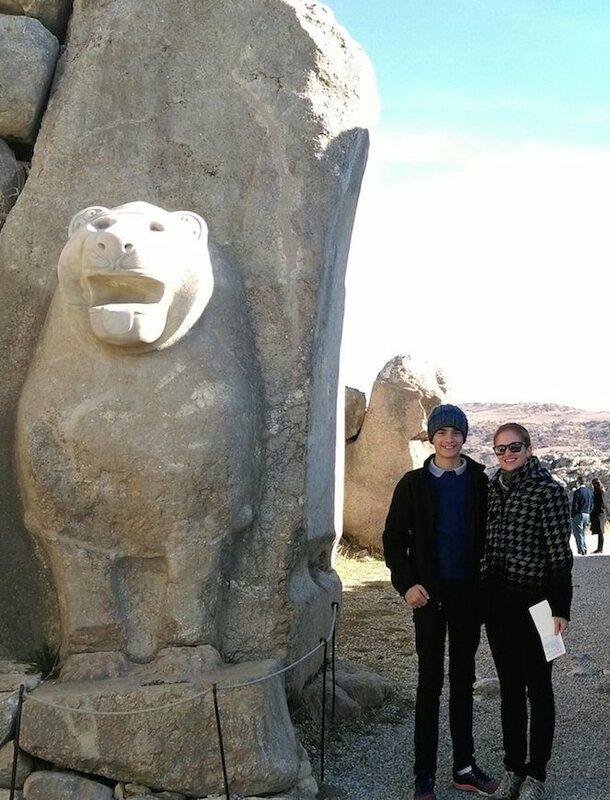 Finally, we visited the Hittite capital at Hattuşa. 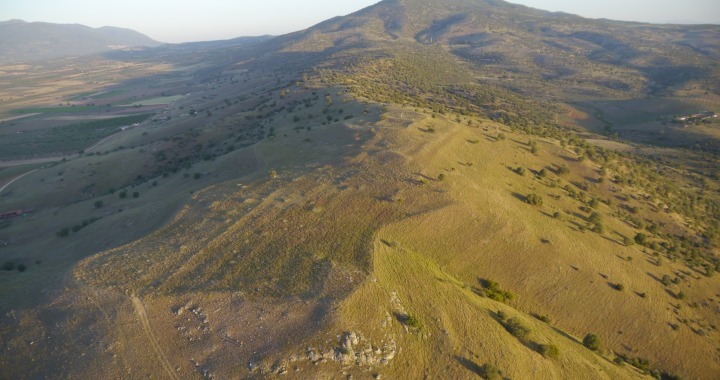 This is yet another site of particular importance for our research, as the Hittites ruled at the same time as Kaymakçı was occupied, and the boundaries of their hegemony may have included Kaymakçı at certain times. 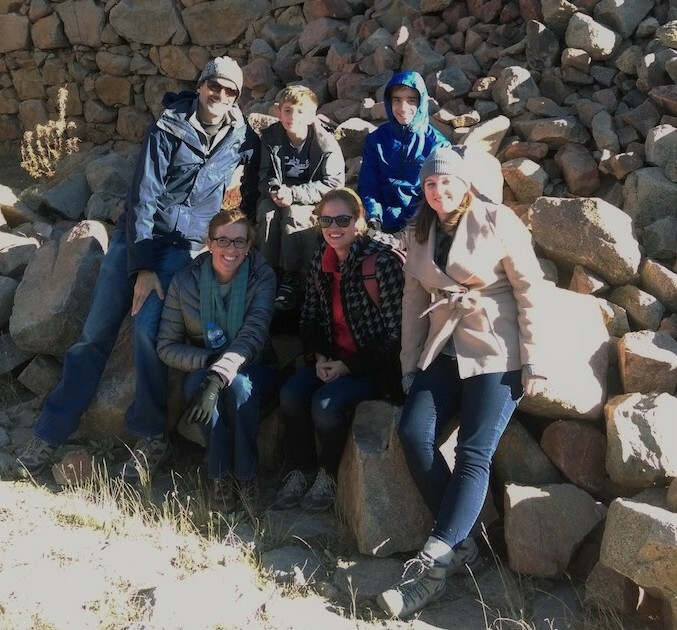 We explored the fortifications, the reconstruction of the mudbrick wall, as well as the temple precincts. 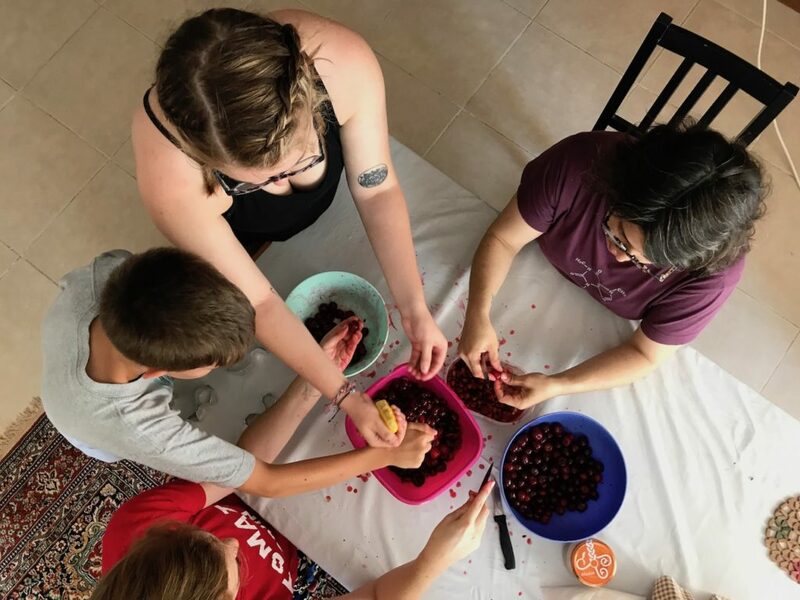 The field season has ended, but work doesn’t stop for project members! 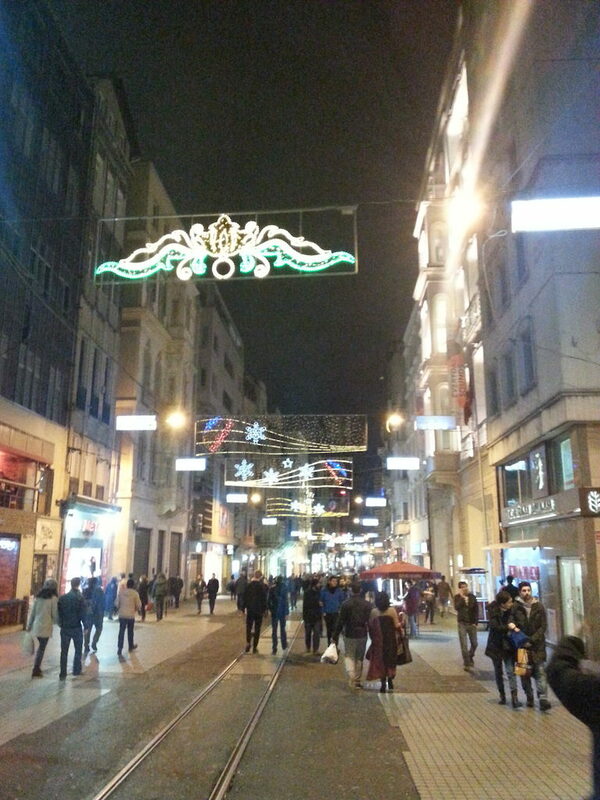 Four of us will continue our research in the heart of Istanbul this year. 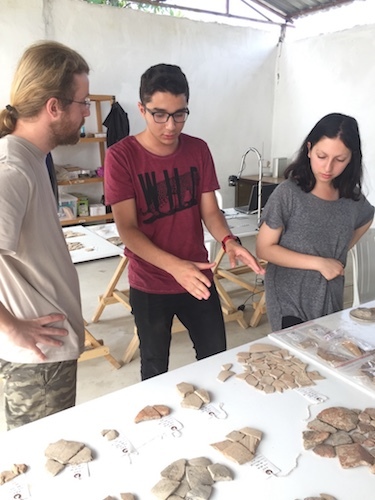 Professor Chris Roosevelt has been appointed as the new director of Koç University’s Research Center for Anatolian Civilizations (RCAC). 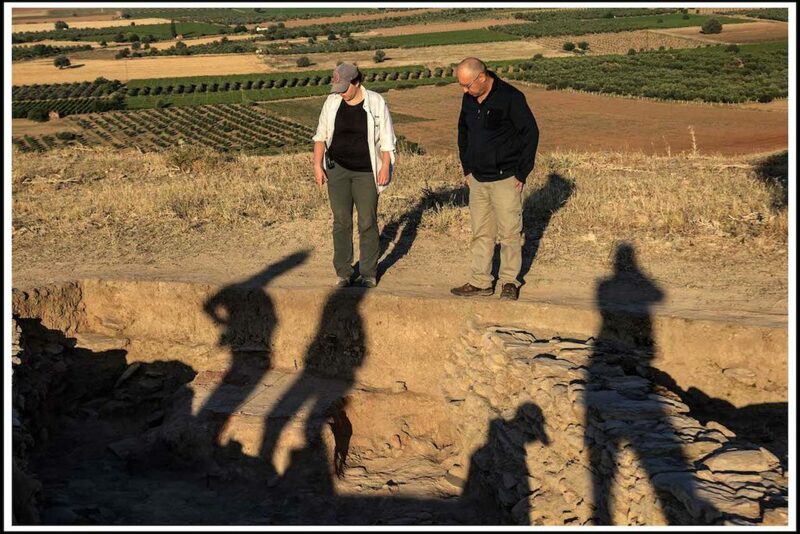 Professor Christina Luke is an associate professor in the Department of Archaeology and History of Art at Koç University. 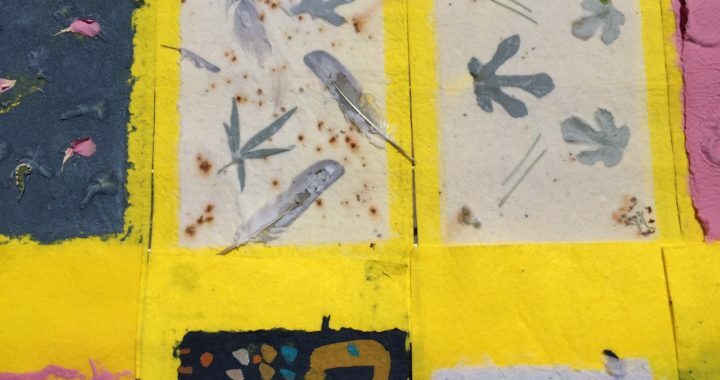 Catherine Scott and Jana Mokrisova have received Junior Fellowships at the RCAC, and will be living at the center located on Istiklal Street for the coming year. 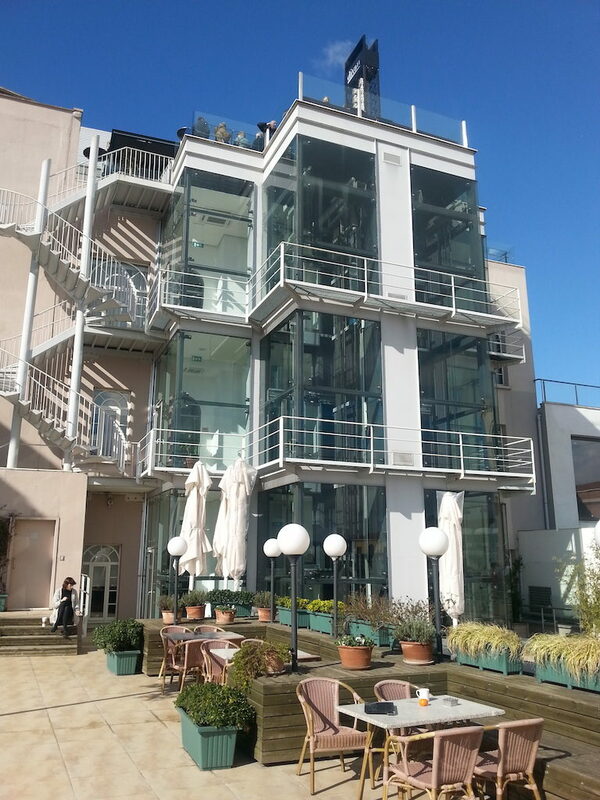 Koç University is one of the main hubs of archaeological research in Istanbul, catering both to the academic community and the general public. 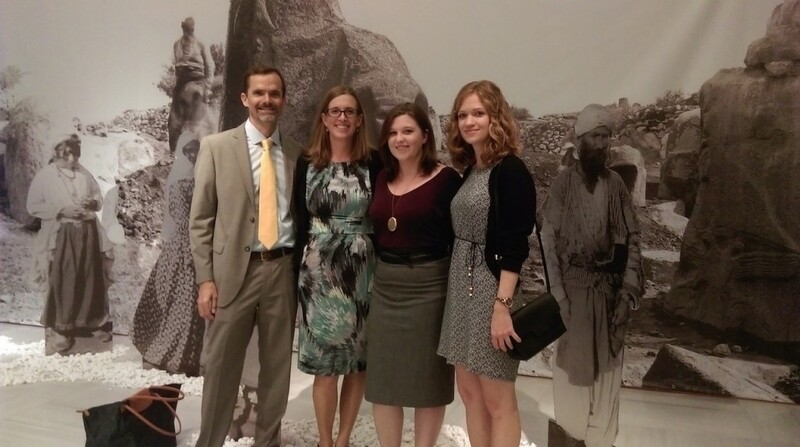 Here you can see project members attending the opening of a public exhibition featuring some intriguing early archaeological photographs, entitled “John Garstang’s Footsteps Across Anatolia,” located at the RCAC and curated by Dr. Alan Greaves. 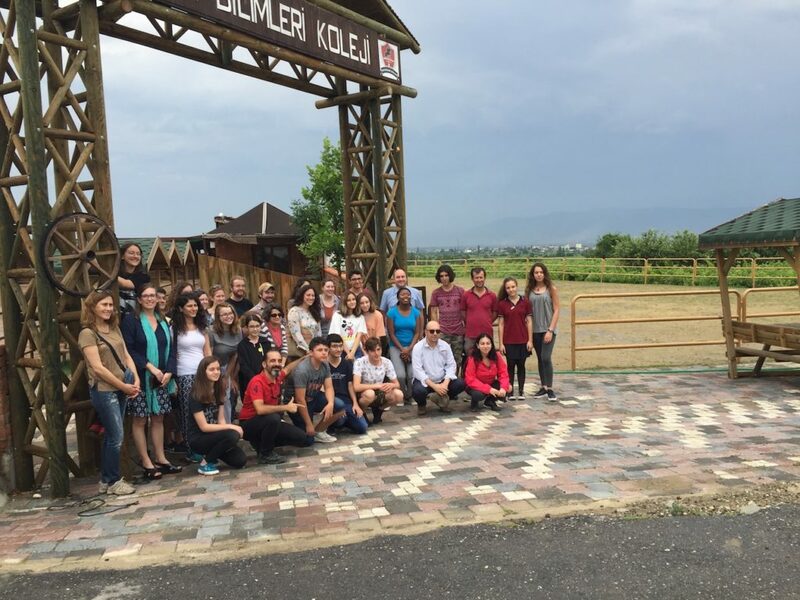 The RCAC is home to an international and interdisciplinary community of scholars dedicated to the study of the history, heritage, and cultures of the civilizations that have inhabited Anatolia. 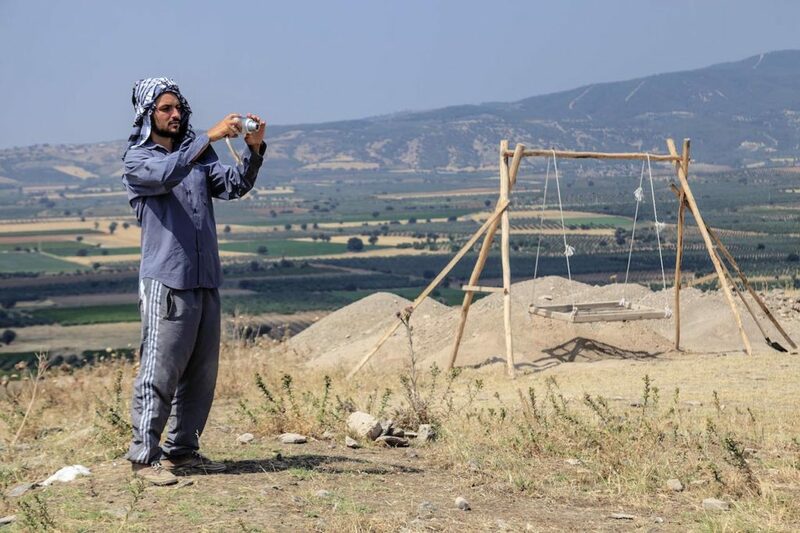 In this way, the missions of the center and Gygaia Projects are similar in that they both advocate the idea that the past should be studied through varied approaches, and that this endeavor should not be divorced from the understanding of contemporary Anatolia.